This very lonnnggg link leads to my blog friend’s Lisa great blog. This week in her ‘experimental year’ of blog entries, she talked about heroes. 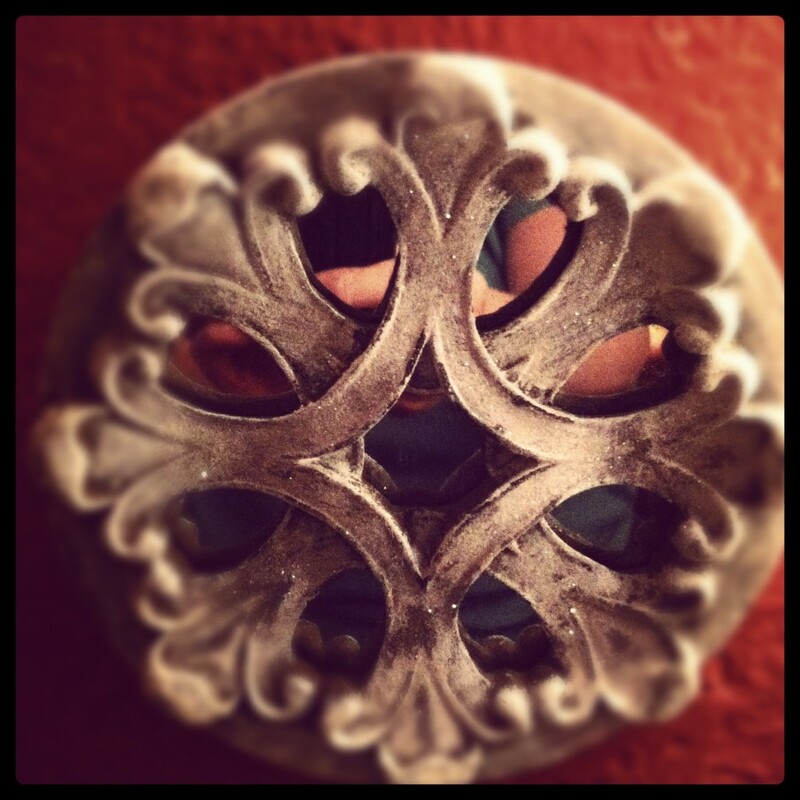 I love her blog because she invites us in and she invites us to share. She makes me think and I like that. I like electronic conversations, I’m sure no one knows that about me…right. I never shut up in person or on paper and this has turned into the Great American Novel. Good thing I’m married to a good listener. My good listener husband is my own hero. We have been through so much together in our almost ten years. The plan we had for our lives when we got married didn’t work out in the end. It all changed when he clobbered a buck doing sixty uphill at night in Montana on his motorcyle. Like Gabby Giffords, Terry suffered a severe traumatic brain injury, TBI in the common parlance these days. We watched the Diane Sawyer hosted show with Gabby and her husband Mark a few nights ago. It was hard for Terry to watch, it made us both cry. It brought back so many tough memories. Terry remembers very little of the early days after his accident but I kept a journal down the whole road back, for which I am eternally grateful because memory can change when you revisit it. Finally conscious, he knows me, but that's about all. Trach tube out, IV tubes out. It does get better. Torin took this picture of us all three years after. 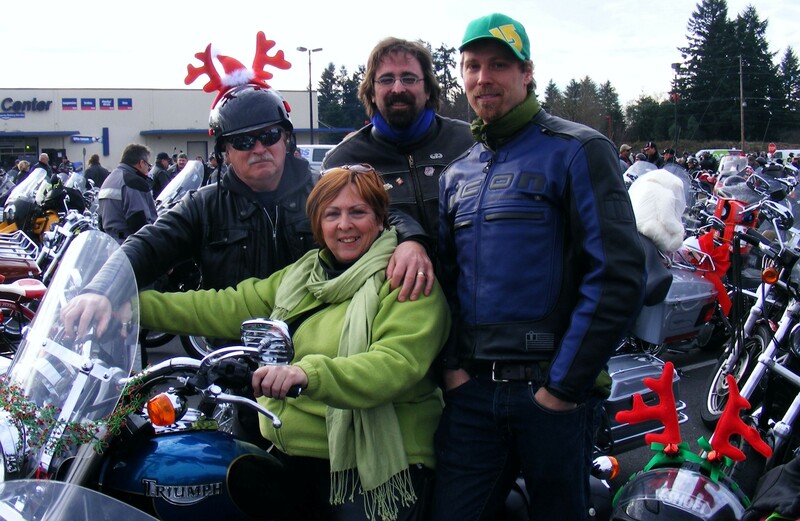 Son Corey in the middle and son Joel on the right at the annual Christmas Toy Run for Charity. My friend Faye is a hero to me. 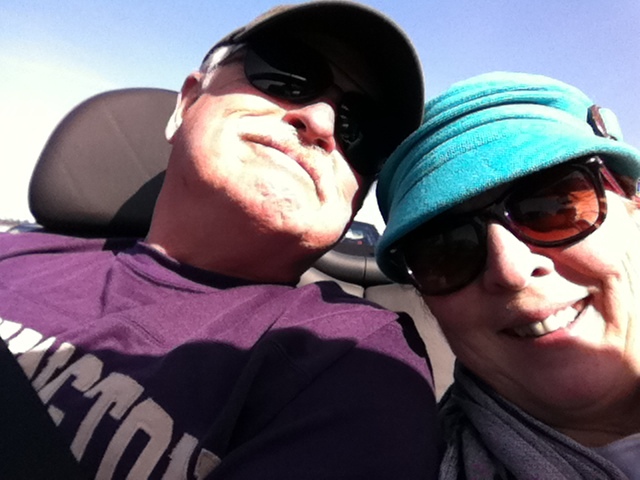 She dropped everything and jumped in the car and drove to Montana with me to be with Terry for those first terrible days in the ICU in Billings when we didn’t know if he would live or be conscious again. My son Corey is a hero too. 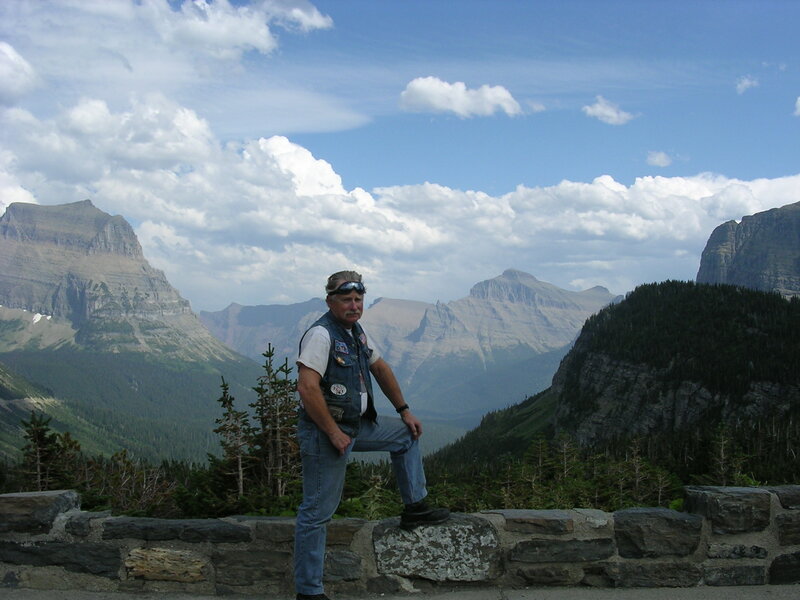 He rode his motorcyle out to Montana in October, just beating the snow, to be with me after Faye had to leave. He also stepped in when I needed him desperately to care for my son Torin who was only 14 at the time. I was in Bakersfield and Torin was alone because of an issue with Terry’s family. Corey gave up two weeks with his own kids to take care of his little brother and our house. Torin is my hero too. He stepped up and tried to become a man at the age of 14, taking on cooking and cleaning and helping mind Terry and keeping me in one piece. He understood there was no time or energy for him. The accident ended his childhood forever. The intensive care unit nurses and doctors in the hospital in Billings, Montana are my heroes. How do they do that day after day? The ICU is not a place that has good outcomes in many, many cases. They see people in life threatening and life ending situations and they get up every day and go to work with positive attitudes. Coming home. 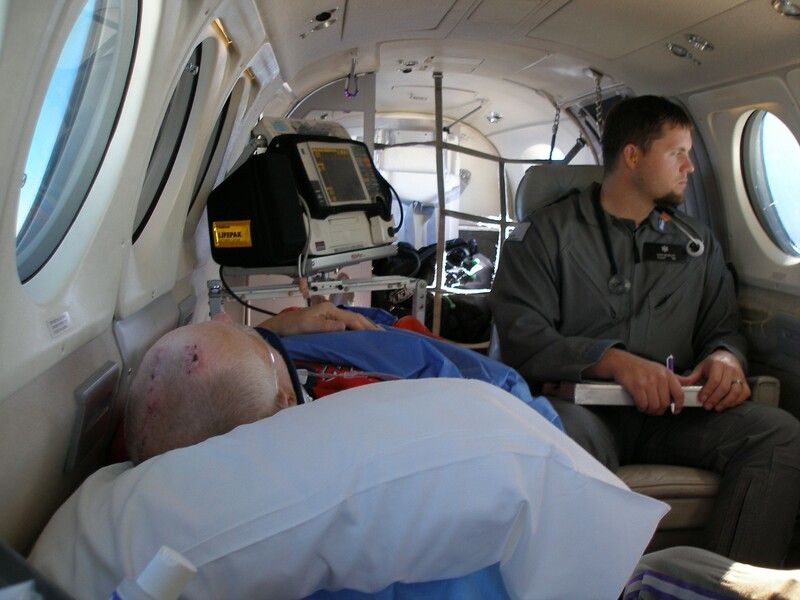 The air nurses who flew us home were the same ones who picked up Terry after the accident to Life Flight him to Billings. They didn't think he would make it. You can see the pressure drainage holes on his head and where they lifted his skull off, we call it his divot. I still want to write a book about what its like for families facing the aftermath of TBI and I’m working on it, in between all the other things I juggle on a daily basis. Don’t get me wrong, I was born to juggle, and it will get finished because the story is important to tell if it will help others in the same leaky boat with their injured loved one. We had in home therapy but it wasn't nearly enough. Why is Terry my hero? Because he fought so hard to get back to us. When he was hurt he lost his short term memory and his ability to do things like count money or write his name or know when a pot of water was boiling. He was an athlete whose balance was gone and now he had to learn to walk again, he fell down a lot. At home with us, he truly thought the laundry hamper was the toilet and he drank soap and put on my clothes thinking they were his. He broke his arm and his neck and all his ribs and punctured both lungs in the crash, physically and mentally he was a wreck.When he came home from the local hospital rehab center, he was physically on the mend but he thought we were keeping him prisoner, the mental issues were just getting into full swing. 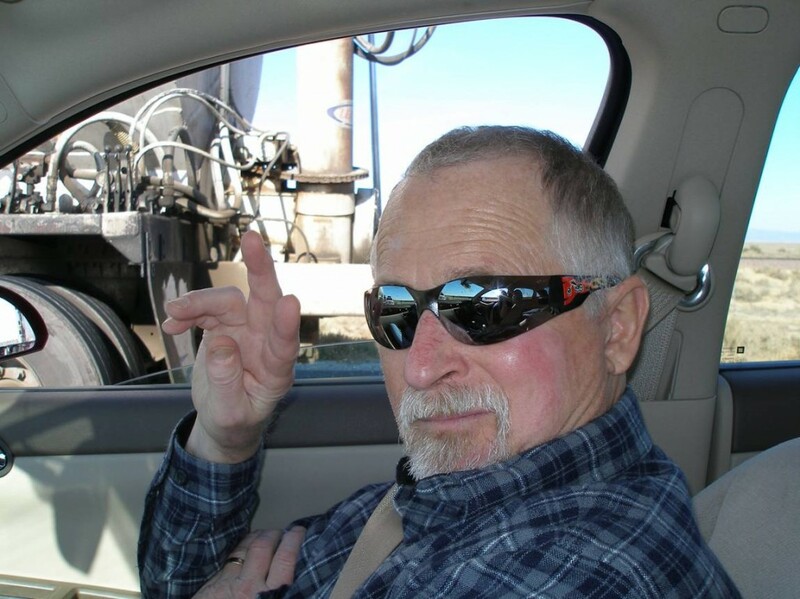 Terry waves to me on the way to Bakersfield. One hour after this, he had a complete meltdown and lost track of reality again. Another one of my heroes is Dr Joe Moisan, Terry’s ombudsman. We found Dr Joe by a miracle and he cut through red tape like he owned Arthur’s sword. Dr Joe was diagnosed with a blood disease and retired before Terry got a chance to meet him and know him, which makes me really sad. 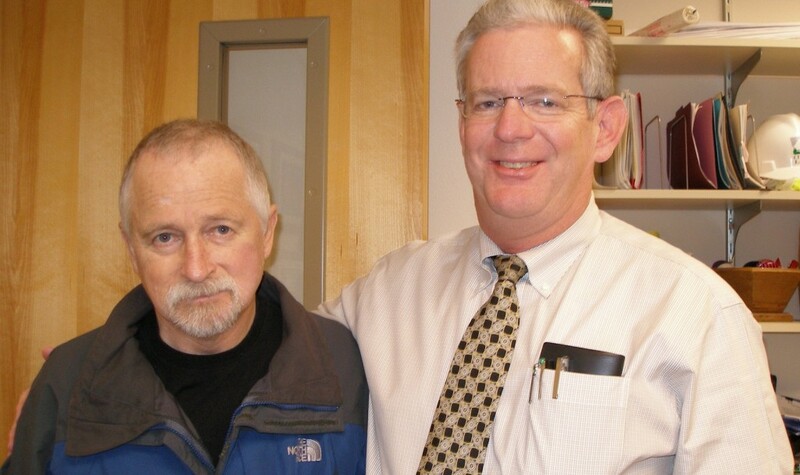 Because of Dr Joe, Terry got a chance to get better. He was accepted into the Centre for Neuroskills in Bakersfield although he was a little past their upper limit in age. The staff at the Centre are my heroes. They deal with with TBI patients 24-7-365 with both a residential and treatment focus. Some patients will get better, some will live there forever. 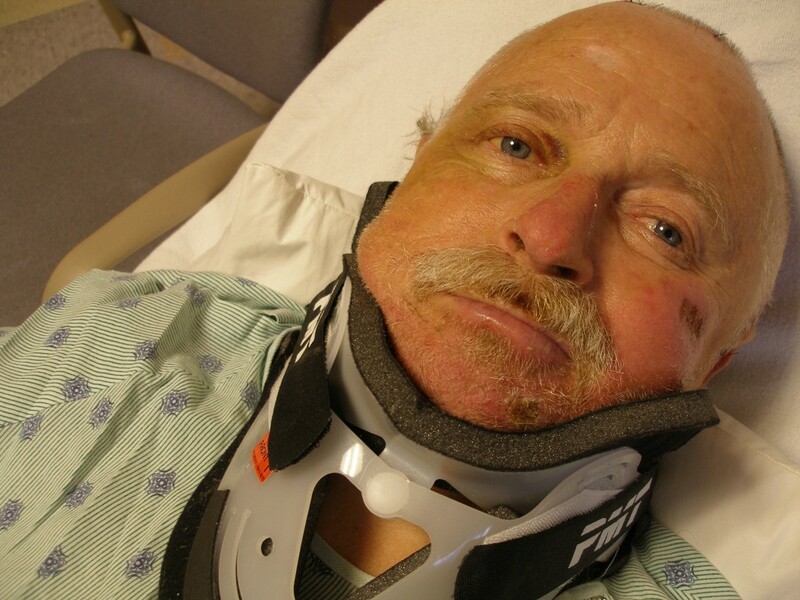 TBI is a terrible thing and its effects are wide ranging and the severity is different in every case. The only potential cure is hours and hours of one-on-one therapy and no one knows how far any one person can get. Their goal is to return the patients to independent living which means learning to shower, get dressed, cook food, all the things we take for granted have to be relearned in many cases. TBI results in some pretty strange crazy. Terry was in many ways a really big three year old, no ability to judge, no ability to make decisions or even actually see what was real and what wasn’t. The people who work with TBI patients have infinite patience and watch over these people like guardian angels every second of every day. Terry went to Bakersfield in November and got into intensive therapy. He didn’t know where he was at first and he kept trying to unscrew the window screens and escape. He thought Bakersfield was Olympia and he was trying to get home to Bellingham. Terry has never lived in Bellingham. He had a breakthrough in December that he remembers, he called me on his little green Migo phone (for small kids only dials a few numbers) to tell me he couldn’t understand how he thought he was in Olympia because it was obviously Bakersfield out there and the doctors were there to help him because he was hurt. I took this on Terry's first furlough after three months at the Centre for Neuroskills. Terry was back. From that breakthrough Terry took off like a rocket. No one has ever worked harder to get better. The doctors told me in our weekly call that he was the most focused and dedicated patient they had ever seen. I remember being afraid to visit him. Would he still be that sad-eyed blank-faced person I had delivered to the Centre? 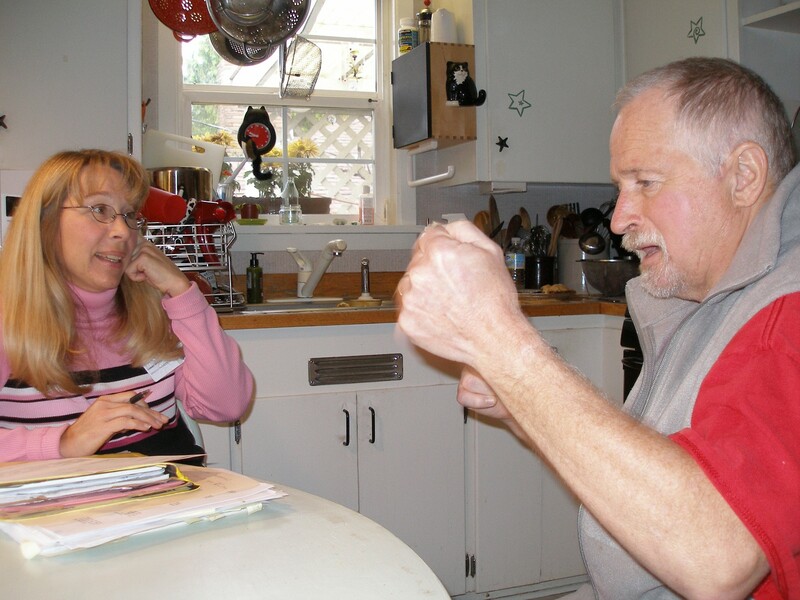 When I rang his doorbell for that first visit to his apartment at the Center in January, Terry answered the door. It was Terry, I could see it in his eyes, he was back. His strange roommates and their minders were so happy for him, that’s a moment I won’t ever forget to be grateful for. Terry and John Neff the day before we headed to Bakersfield. We lost John to canceer a few months ago. I will be eternally grateful for everything he did for me. He was Terry's boss. Here at home, John Neff and John Hartung and Darell A. are heroes too. They didn’t have to, but they stepped in and made sure we were going to be okay. John Neff, who passed on recently, marshalled the staff from the City of Lacey to make improvements to our house so Terry could come home from the hospital. 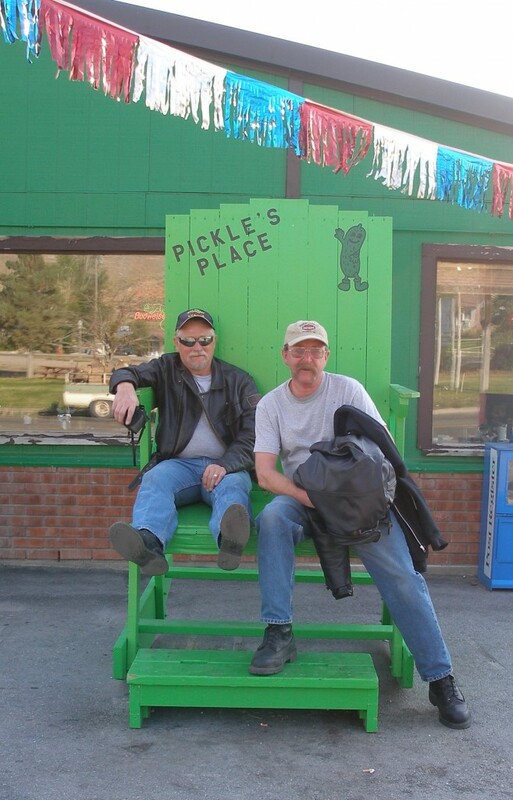 John Hartung and Darrell spearheaded a fundraising drive which helped offset the travel costs of going back and forth to Montana and to Bakersfield. I owe so many people so many thanks I could write a blog and just list names. Terry came home from Bakersfield in April. He was different. I have said its been like being married to his twin. A little odd sometimes but he’s still Terry. We had a huge party and invited everyone who had lent a hand, we were so happy to have Terry able to hug everybody and give them his own thanks. Best party ever. 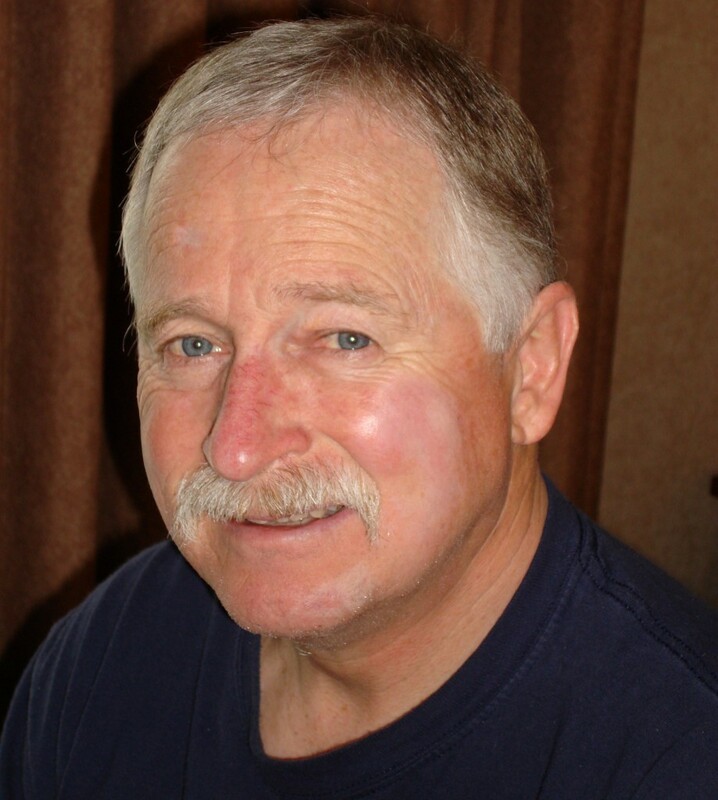 He returned to his job as Fire Inspector, thanks to John Neff who believed in him every step of the way. It was hard for him, people look at TBI people like they might go bat flap crazy any minute, or drool, or forget, fill in your preferred symptom. He knew lots of people were waiting for him to screw up and prove he couldn’t do it. He didn’t fail. He went to work every day and he felt like a leper a lot of the time but he did it. Five years later he’s still doing it. Life has gotten easier but it still has challenges. He can’t retire yet because of the financial burden of the accident, ancillary costs of my losing my job to care for him and the things you never plan for and think about. He’s tired, but he still gets up and gets it done every single day. He can’t run anymore which breaks his heart, but he walks every day, sometimes twice a day. 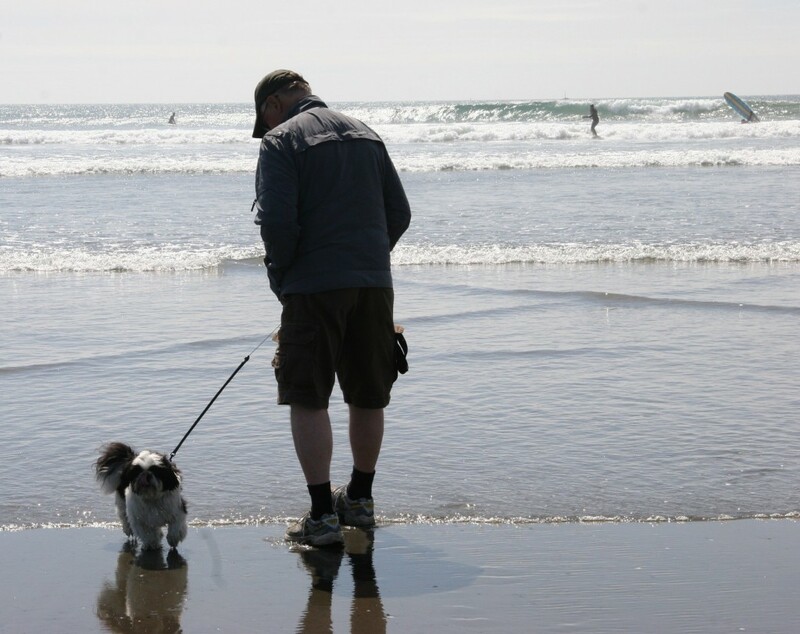 His beloved dog Meesh would not be happy without his walkies. Terry gets foggy and forgetful when he is really tired and we adjust for that now. He has lost the ability to feel emotional highs and lows in a lot of cases which has been hard for both of us. Our lives have changed, and he was depressed enough to go into therapy. He wanted old Terry back. His doctor told him old Terry was gone forever and he needed to face that and get to know new Terry. He has done that. Every day is hard when you are someone you didn’t used to be. For 60 years he was exactly who he wanted to be and now he faces a different man in the mirror every morning. Because he fought like a tiger to come back to us, and because he proved everyone who said he couldn’t do it wrong, and because he never gives up no matter what, he is my hero. This entry was posted in Down the Rabbit Hole:TBI, Life, the Universe and Everything and tagged heroes, TBI, TBI and hope, TBI recovery, traumatic brain injury recovery on November 16, 2011 by rox. 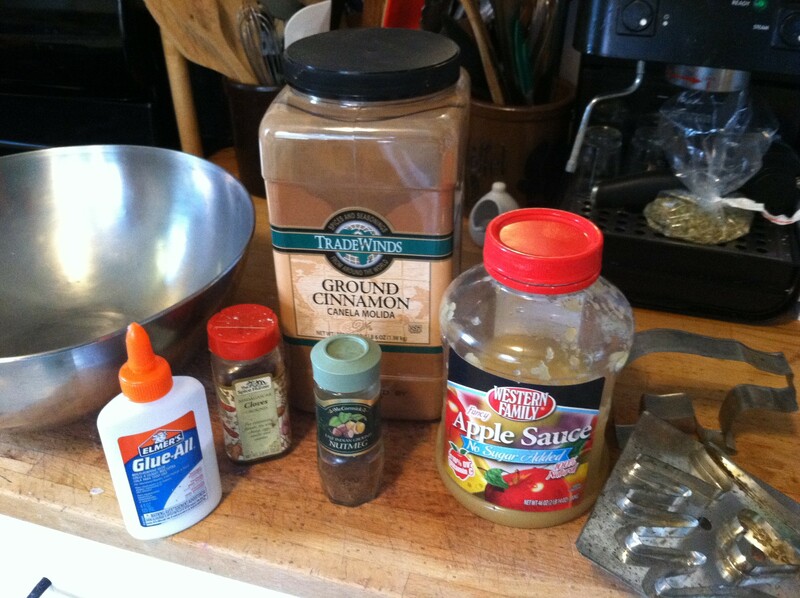 This blog is the how to step by step for fun and fabulous ornaments made out of cinnamon, glue, applesauce and spices. 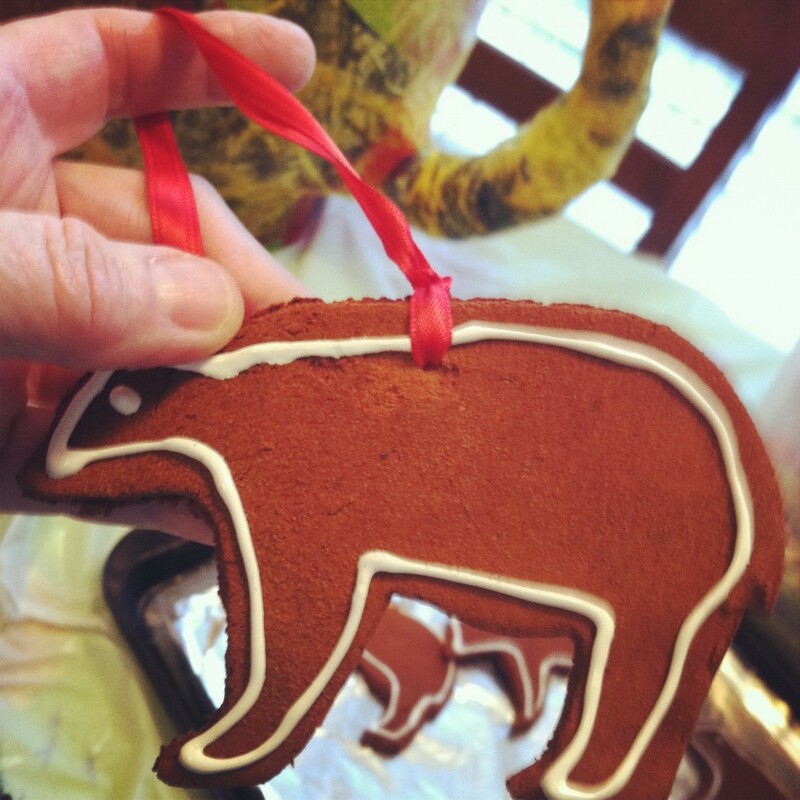 These smell so good you may want them hanging around all year long. My Christmas Forest tree for the annual Providence Saint Peter Foundation fundraiser is themed as a “Teddy Bear Christmas Tea Party”, and tea means COOKIES. 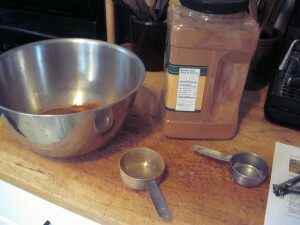 The recipe is easy to make, the hardest part was finding a giant container of cinnamon. My Tbear Tree posse person, Carolee, recommended that I look at our local restaurant supply store. Bingo. Giant jar of cinnamon around $15. Enough to make dozens and dozens of cookies! Cinnamon also keeps almost forever if you keep it dry and cool, leftovers can be saved for next year’s fun. By the way, I have discovered this is easy to double and very forgiving. 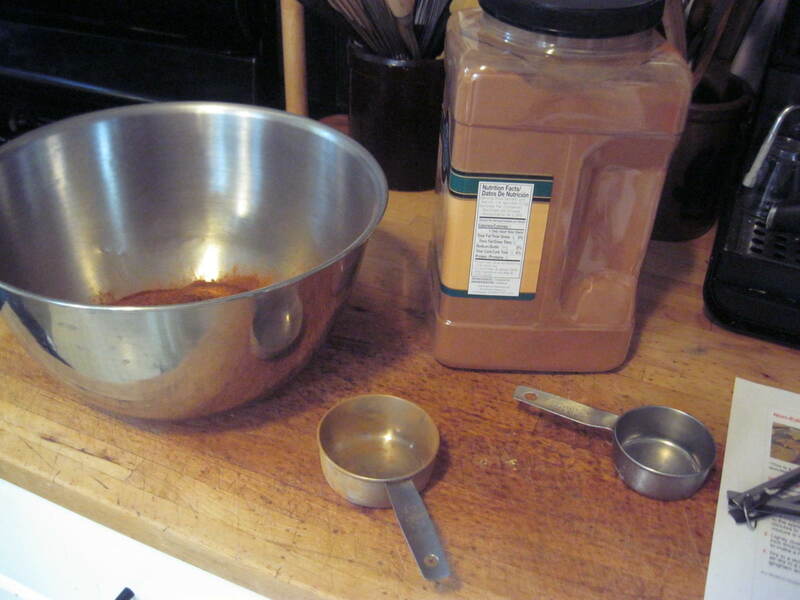 Use your hands to mix all the ingredients together. If it feels too wet to roll out, add more cinnamon. Too dry? 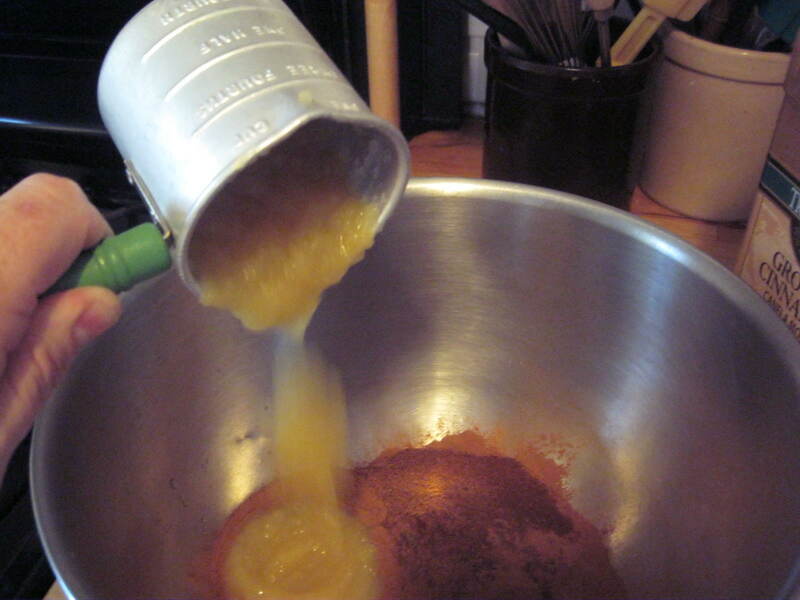 Add a little more applesauce. Knead it well and then grab a chunk of it and your plastic wrap. TIP: It’s easier to roll glue dough or cookies or piecrust or anything you have to roll out with a rolling pin if you roll it between two sheets of plastic wrap. 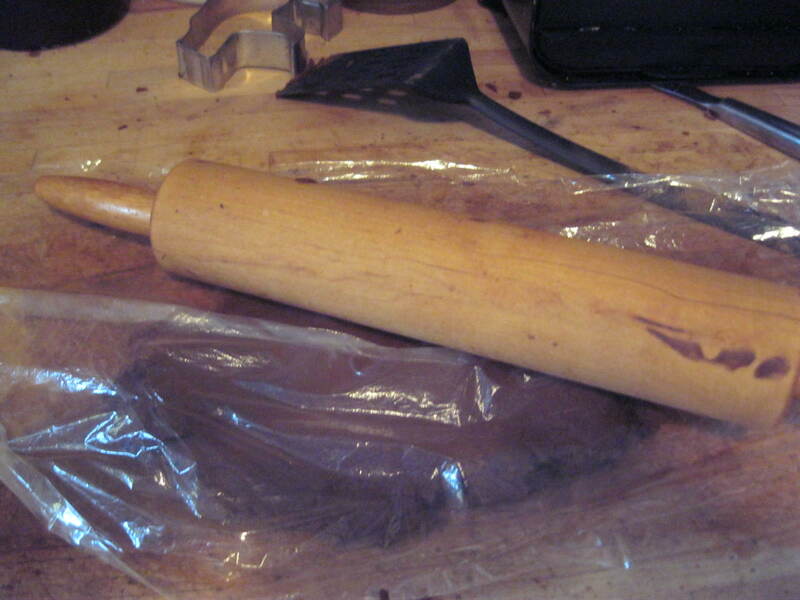 It keeps your rolling pin clean, nothing sticks to the counter and clean up is much easier. 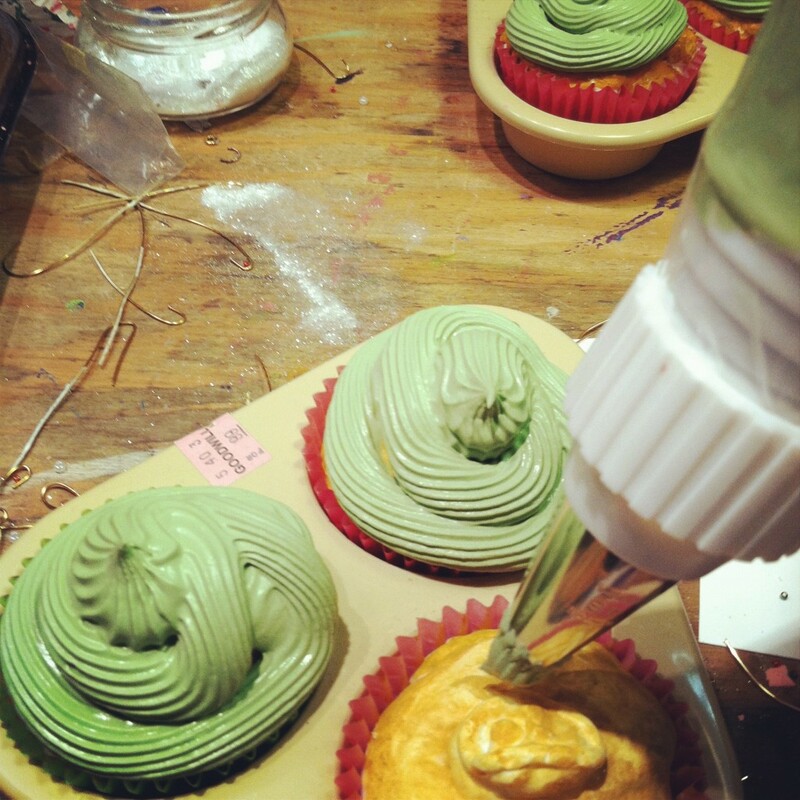 Plastic wrap helps keep sticky mess to a minium. Roll the dough just like cookies and peel off the wrap before cutting. Dust the counter with cinnamon before cutting the ‘cookies’ and if you don’t use plastic wrap, make sure you dust everything very lightly with cinnamon, it acts like flour does when you make real cookies. If your dough is rolled too thin thin your cookies will curl. If its too thick they dry very, very slowly. Mine worked best a little over a quarter inch thick. 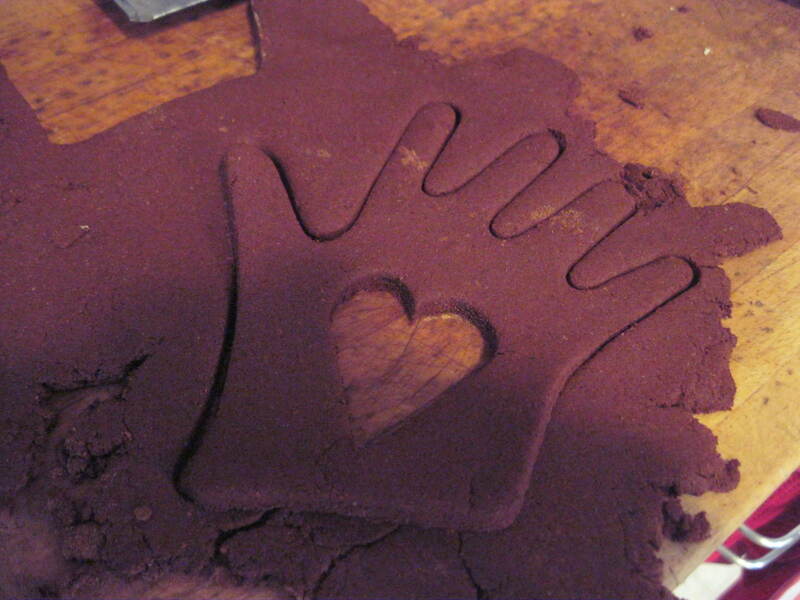 Heart in Hand, perfect no? I choose two cutters, one is an old, old heart in hand which I love, love, love and the other is a bear. I collect cookie cutters and I’m always hunting for more unusual ones. If you want to collect something that is inexpensive and fun to find anywhere, go for cookie cutters. I even found one this summer shaped like a chili pepper at the gift shop on the North Rim of the Grand Canyon. This past weekend I found a vintage plastic duck and a clown for two bucks each. See? cheap. I’m not a purist, I don’t insist on copper, I only care about the fun factor. Cookie tasters always lurk in the shadows. 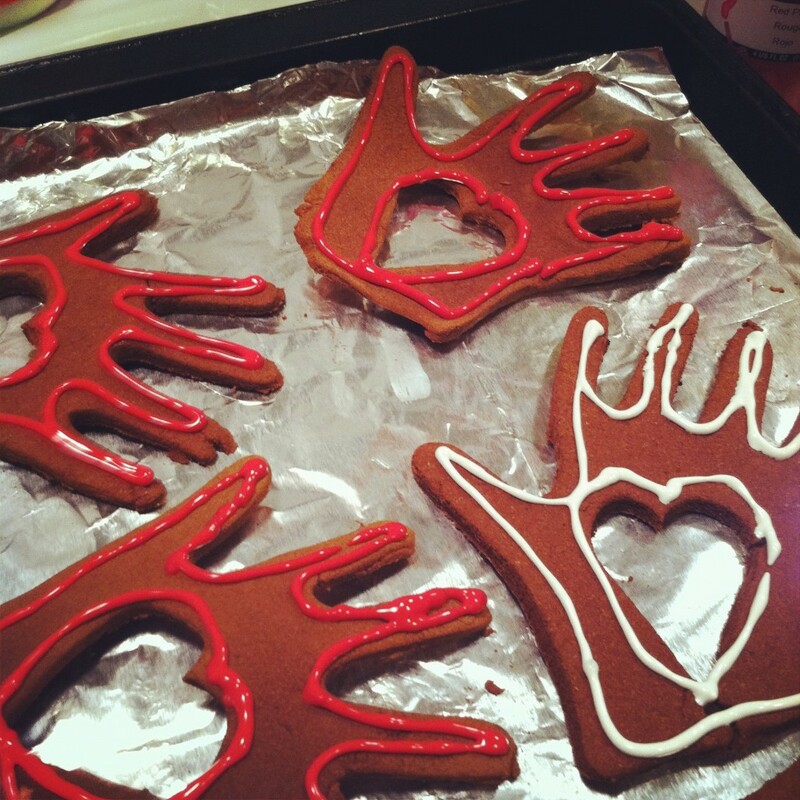 Every year we use those cutters and have a big cookie party and the kids have a ball, and make a huge mess. Notice the tasters slipping into the room? Nothing goes to waste. if they want to stick, slide a spatula underneath. 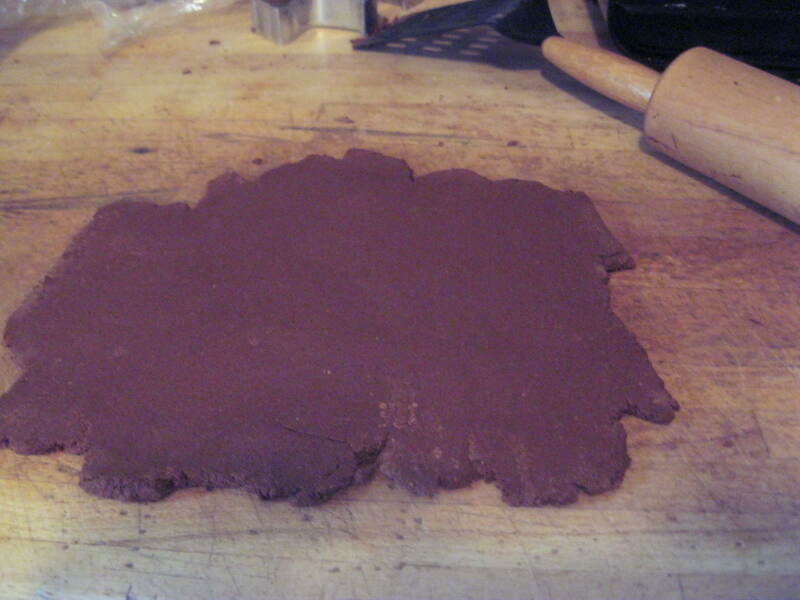 Back to these non-edible cookies though: Cut them out and have a sharp edged spatula handy to help slice them loose if they want to stick to your counter. Plastic spats, not so much. 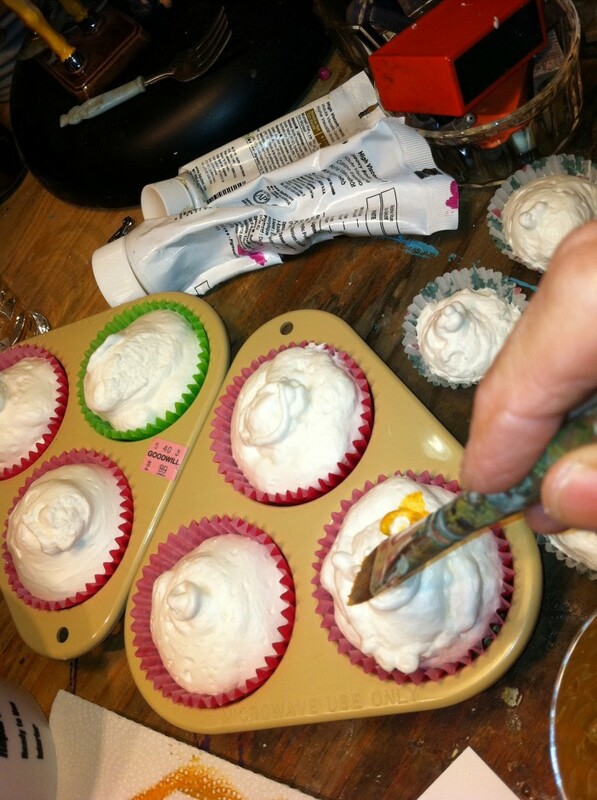 One of those old cake decorating spatulas works great. TIP: Use a plastic straw to poke a good sized hole where you want run your ribbon or string through. I got smart and did this with batch number two. I covered my cookie sheets with tin foil, there is glue in the dough and I didn’t know what kind of sticky factor I was facing. I was going to use the same foil to make sure I didn’t spread ‘frosting’ all over the place either. If you live where the sun shines and the air is dry, you can air dry your ‘cookies’ over several days. I however, live in damp Washington State, so into the oven they went at 180 degrees for several hours. 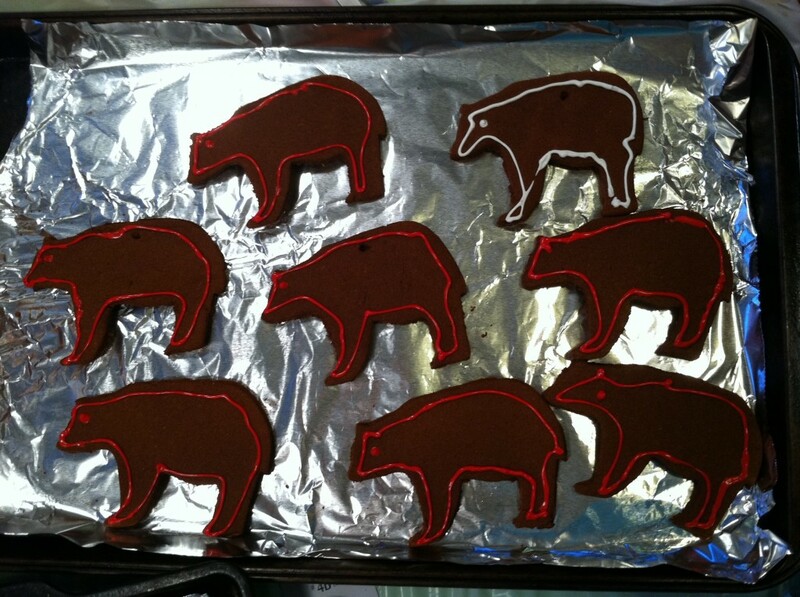 After about 4 hours, I flipped them over so they dried evenly. They are very nice just the way they are and they smell wonderful. I really like the nutmeg and cloves added in this recipe because it does cut down the overpowering cinnamon smell a little bit. While these bake your house is going to smell like a craft shop at Christmas so open a window if cinnamon overpowers your nasal passages. I can never let well enough alone. I thought for awhile about using plastic or joint compound to pipe on decorations that would be permanent and not spoil but I had a better idea. Ah ha! Fabric paint! I used yet another coupon from Michael’s and got two three dollar bottles of puffy fabric paint. It worked perfectly! 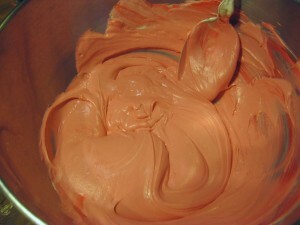 After an all night drying the paint looks just like frosting. I made life difficult for myself by not putting in big enough holes, which meant I had to take my dremel tool and drill holes in my cookies. Not bright, but it worked well. You could use string or cord to hang your cutouts but I love the way narrow ribbon looks. I also discovered glue will put broken ‘cookies’ back together. I had to stick a finger back on and you can’t see the mend. They really look cute and I made a few to keep for my family too. 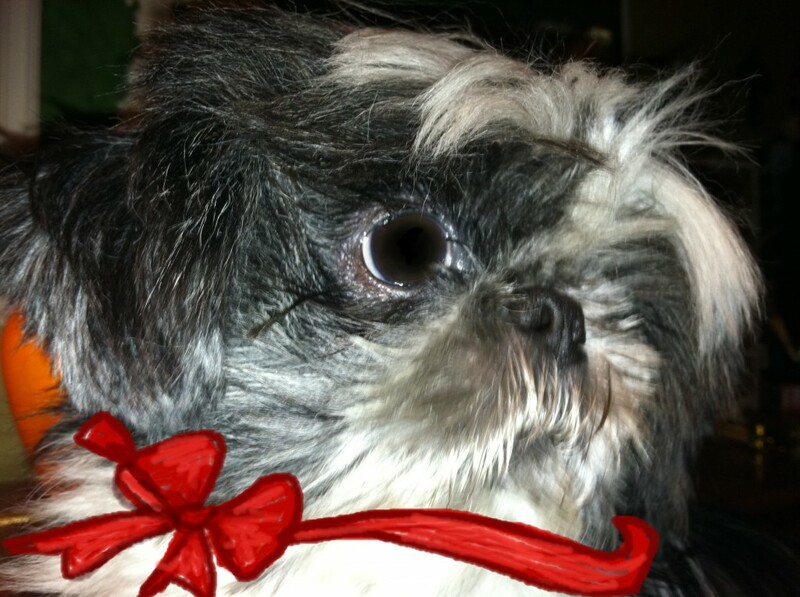 The only person who didn’t like the cookies was Mooshka who was hoping for real cookies. Fun, easy to do with your family too. 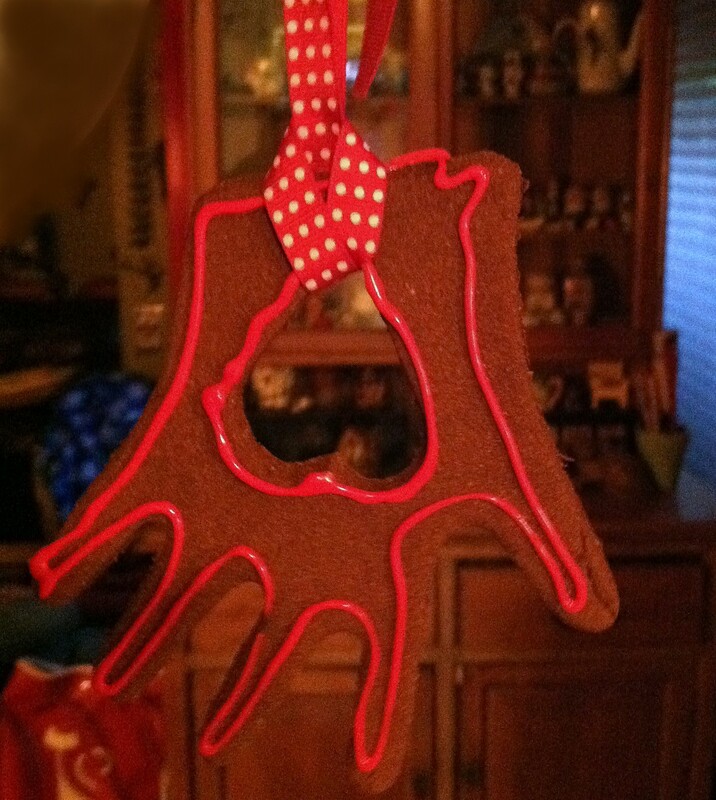 This entry was posted in Christmas Bunny, Directions for making cool stuff and tagged applesauce cinnamon glue ornaments, Chirstmas crafts with kids, cinnamon ornaments, directions for cinnamon applessauce ornaments, easy ornaments, frosting cinnamon ornaments on November 15, 2011 by rox. Chirstmas Forest Update: The teddy bear tree is well underway, the Christmas Forest installation is Tree minus 7 and counting down. 125 plus Teds are in the attic waiting for their debut, trays are painted and waiting to have tea sets applied. 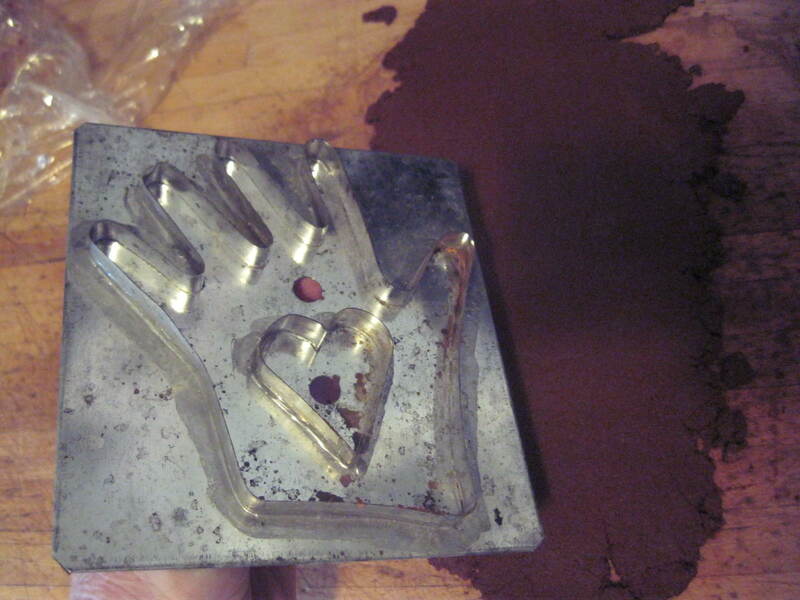 The tree topping tea pot is drying , the tea table has been found, and the most fun of all so far is CUP FAKES! What’s at tea party without treats? Pretty dull all around. 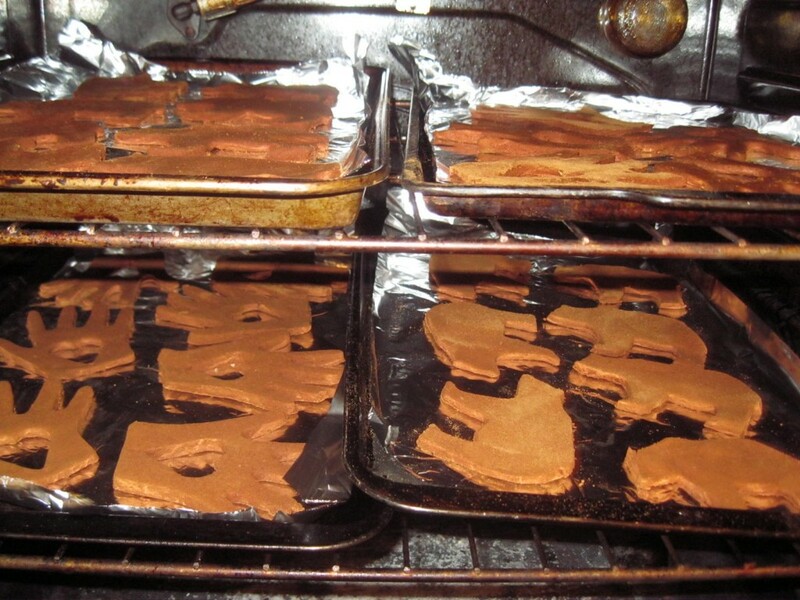 The problem was how to make fun treats that looked real but weren’t. After dredging around on the internet I came up with a few ‘recipes’ and here is the first ‘treat’ result and the how to for your own. Won’t these be fun hung on the tree? The first thing to consider is what are you going to use for a pan? I went to Good Will and scrounged around for some muffin pans because I try really hard not to combine food and chemistry if at all possible. 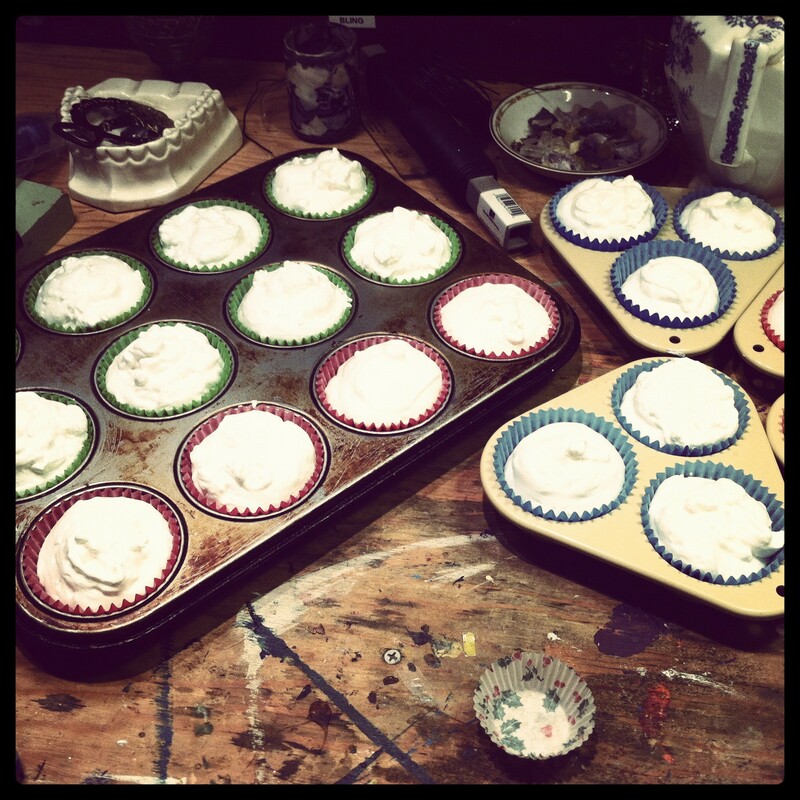 I picked up cup cake papers in vibrant colors and popped them in each hole of my pans. I read on line about the perils of expanding foam. This is the stuff you use to fill holes and for insulation around the house. It really does expand and its horribly sticky and gooey. Rubber gloves, paper towels, acetone and all kinds of goo removers were encouraged in each ‘recipe’. Strolling down the aisles of Lowe’s Home Improvement store I actually found some foam that was water clean up, Daptex Multipurpose foam sealer, which promised not to expand hugely. A shot in the dark. Would it work as well? I thought it was worth a try. 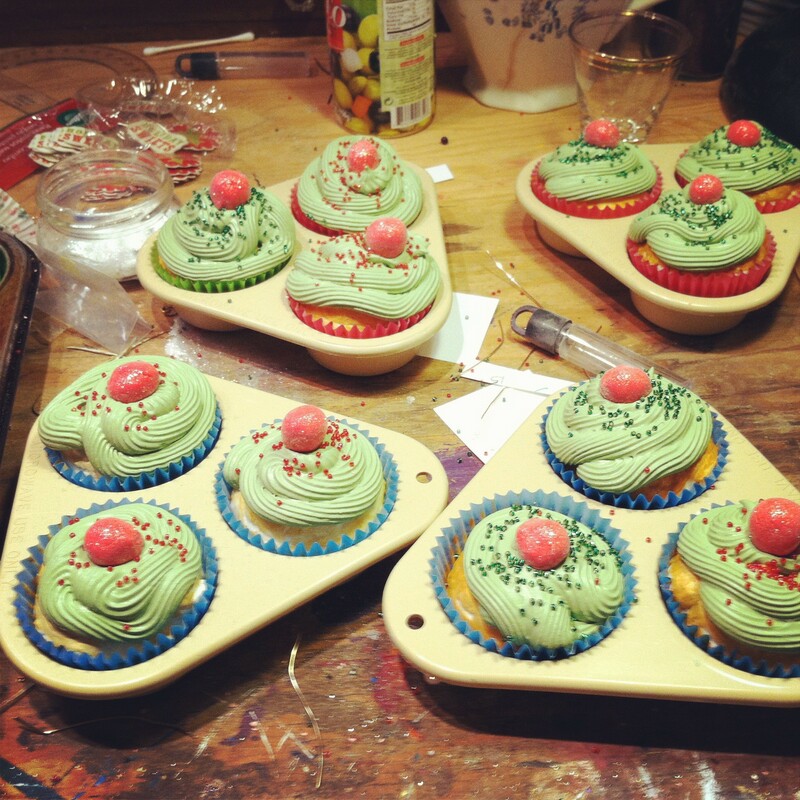 My gal pals aka, elves, were in the studio sticking tape to tea pot trays and we all had a try at filling the muffin pans. 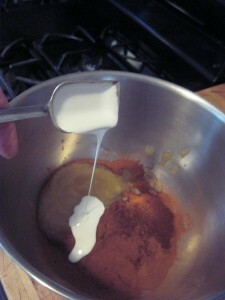 The result looked rather like angel food cake. I put them aside to dry after reading the instructions that the foam would be cured in 24 hours. Word of advice: this foam has a lot of water in it and I discovered the next morning that the cupfakes were dampish on the bottom and firm on the top. I simply flipped each one upside down in their holes and let them dry another two days. This foam does not get crispy and hard like the tan horribly gooey stuff that is also used for expanding foam purposes. This stays somewhat pliable which has its own set of problems and rewards. When everything was dry it was time to make them look like cake. Cake is not white, cake is golden, I wanted to seal the tops of the foam ‘cakes’ so painting them with acrylics seemed to be the two-birds-in-one solution. I used two colors, including one that looked orangey:gold ocher, and a brown: burnt umber, I also put a blob of white on the plate to mix with. I used a little cup of water to rinse my brush and thin down the paint. I wanted to cover them not frost them with the paint. I used a stiff bristle brush and did not drag really hard on the cake tops because this softer foam will get soggy and it will tear if addressed with heavy-handed enthusiasm. A light touch works best. 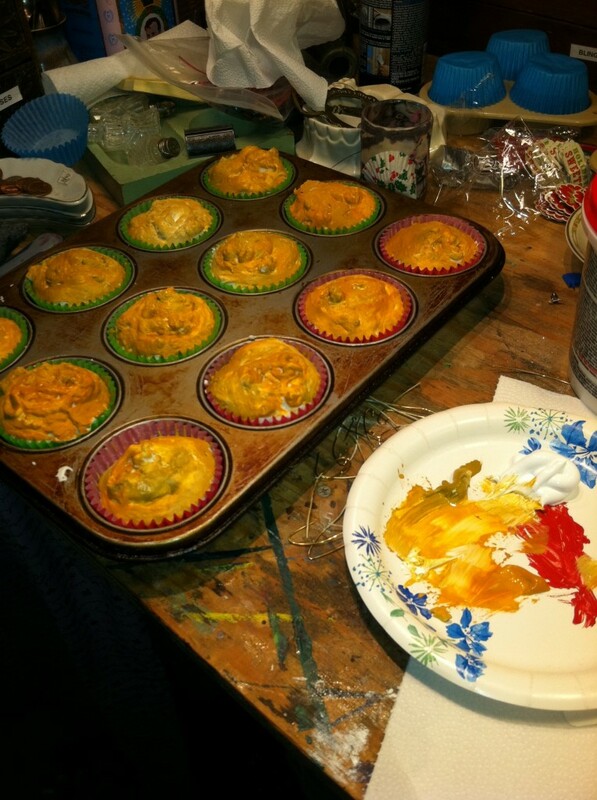 I put the painted cakes away to dry overnight. For frosting I used a quart container of Dap patching plaster. In hindsight I’d like to find something a little stiffer next time. This stuff took two hours to harden up enough to put in a piping tube. 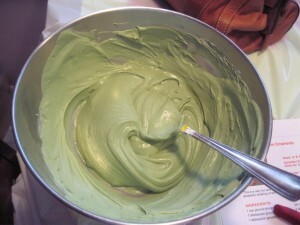 I’m not sure if it was because of the addition of paint as a colorant or if it is just really squishy when you stir it. 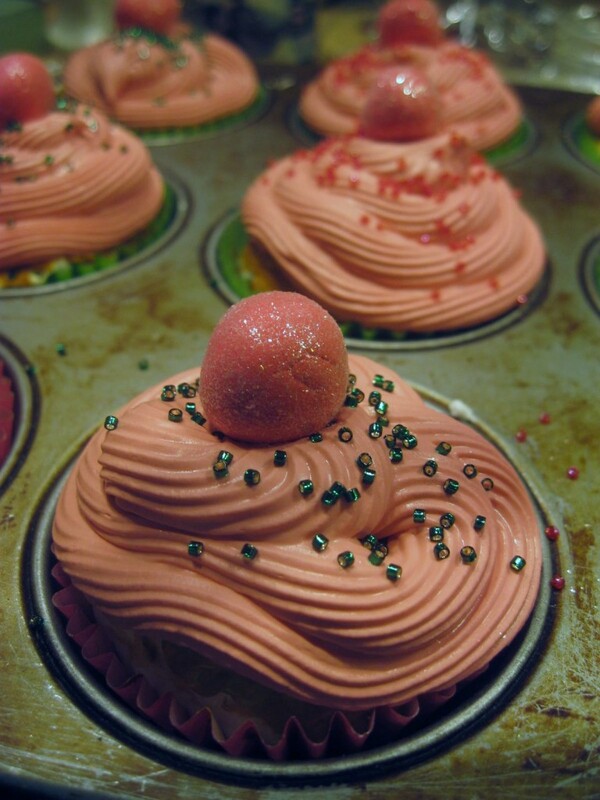 I made a batch of pink cupcake frosting and a batch of green cupcake frosting. It was fun getting the plaster into the piping tube. I used a big rose tip that cost me $1.49 and I also picked up a batch of disposable bags to make easier. I found a collar thingie that holds the tip for $2.49. (Michael’s in the Wilton section) This I scrubbled thoroughly after I used it because it will work for pretty cool real cupcake frosting in its sterilized and now plaster free state. I used a big old silver spoon to ladle the plaster into the bag while trying not to get it all over me. I did a test run on a paper towel and then piped a long spiral onto each cupfake. I started on the outside and wound the piping around and then pulled it up into a peak by just pulling the piping tube up and away. It really is easy. I piped one color of frosting on all the cakes that I wanted green and then cleaned the bowl and tip and did the same with the pink, again waiting for it to get a bit stiff so it would hold the shape I was piping. 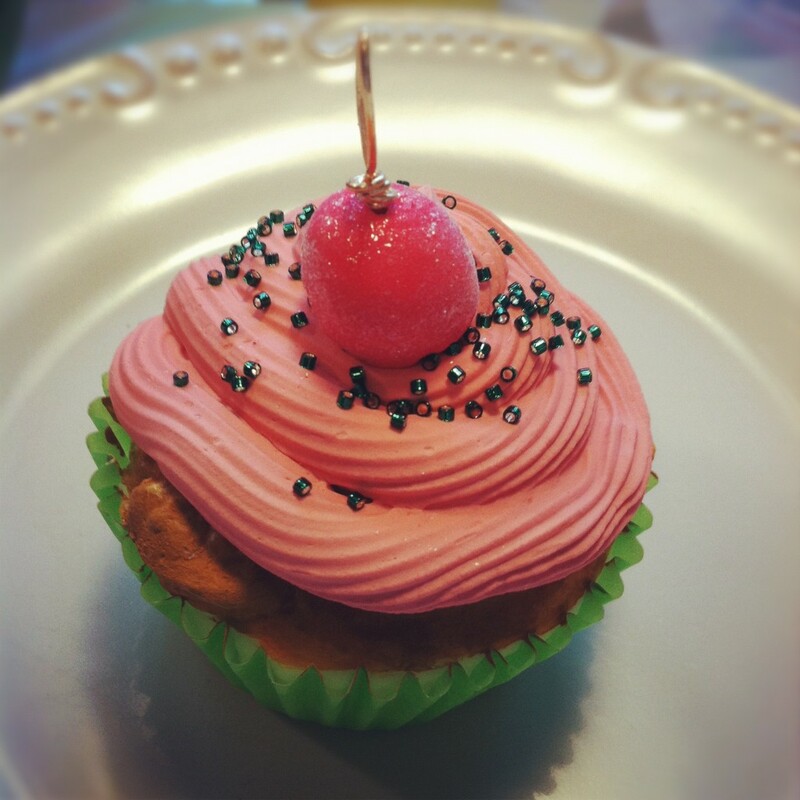 While the cakes were good and wet I put a cherry on top of each one. 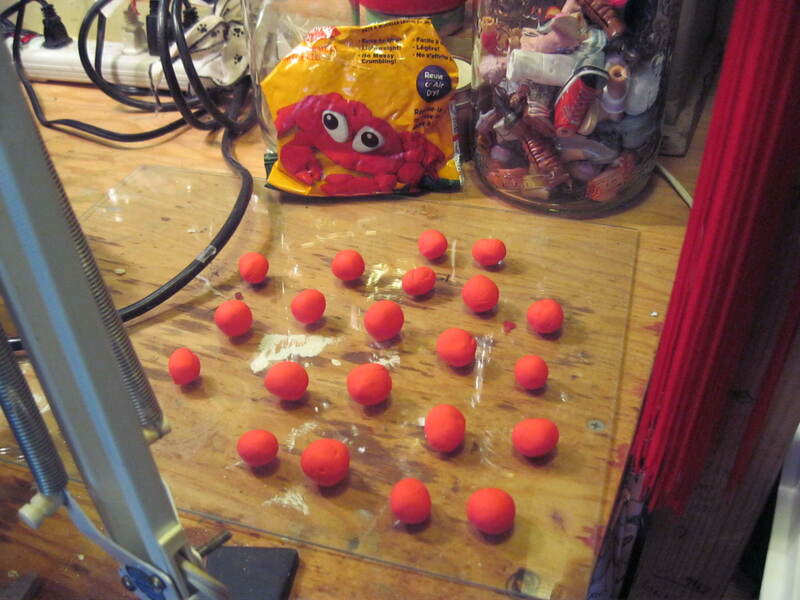 My ‘cherries’ were made of Crayola air dry modeling foam. Great stuff, weighs nothing and easy to use. 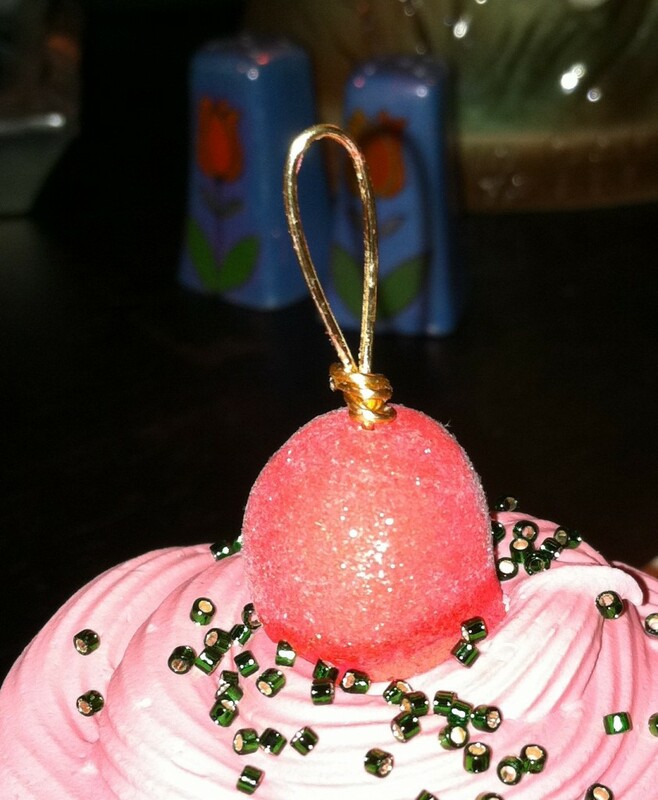 I couldn’t resist, I had to roll my cherries in German glitter…. I quickly put ‘sprinkles’ on each cake too. I found the little bittly glass beads work great and look like sugar sparkles. $2.99 for a small tube, again at Michael’s. I finished all the pink ones last night and the green ones today. Note to self: small pearls don’t work worth a darn. I had to go back and glue them on one at a time. I picked up one of the pink dry ones found it was a little pliable and almost eerily real. Next problem: how to hang them from the tree? 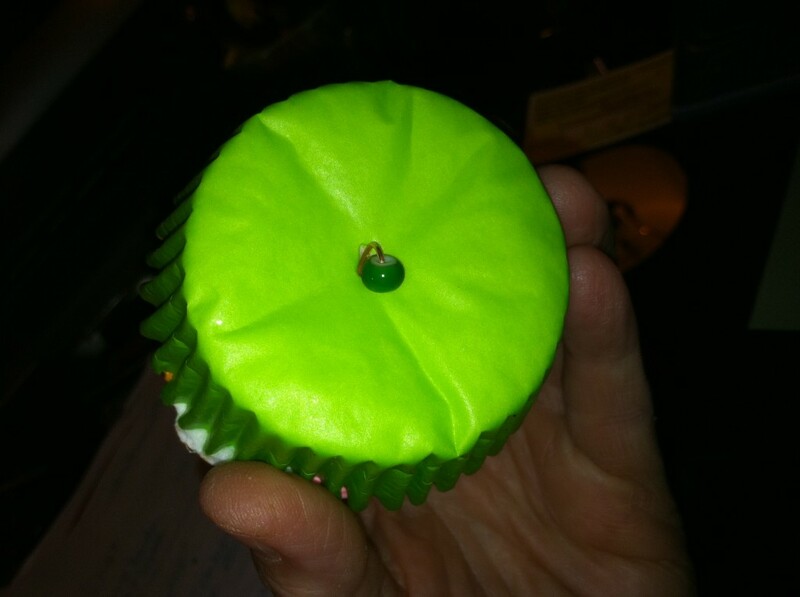 Solution: I took a long piece of wire, made very sure it was very straight and ran it from the top down, taking care that it exited the fragile paper wrapper in the middle of the bottom of the cupfake. I pulled it all the way through with about three inches showing and laid the cake on its side. I put a little bead on the bottom and then did a wire wrap finish. I pulled the finished wired up firmly above the cherry and wrapped it and clipped to create a hanging loop that looks polished and perfect. I love these, they are adorable and they have made me lust after real cupcakes which I will bake tonight and really enjoy after this foray into fake food. 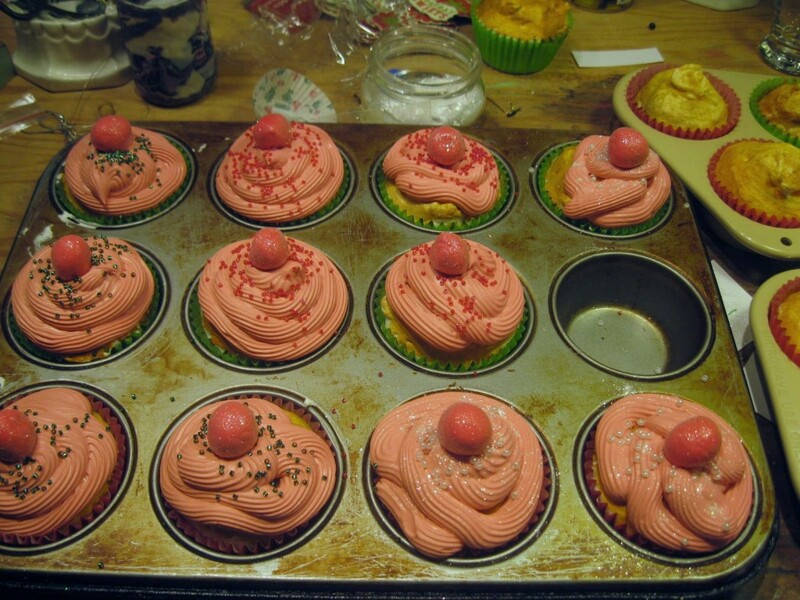 This entry was posted in Christmas Bunny, Directions for making cool stuff and tagged cup cake decoration, cupfakes, fake cupcakes on November 12, 2011 by rox. I love sparkly things. I must have been a magpie in a former life because I’m easily distracted by glittery stuff in this one. For me the holiday is all about sparkle, the glint of moonlight on snow, tinsel and twinkly lights on trees and glitter. Lots and lots of glitter. 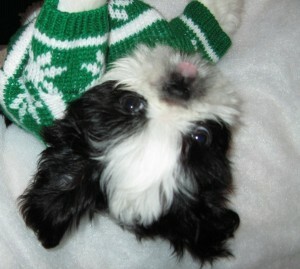 Even cuter than glitter, baby Meesha last year at Christmas. The best glitter on the planet is German glass glitter. 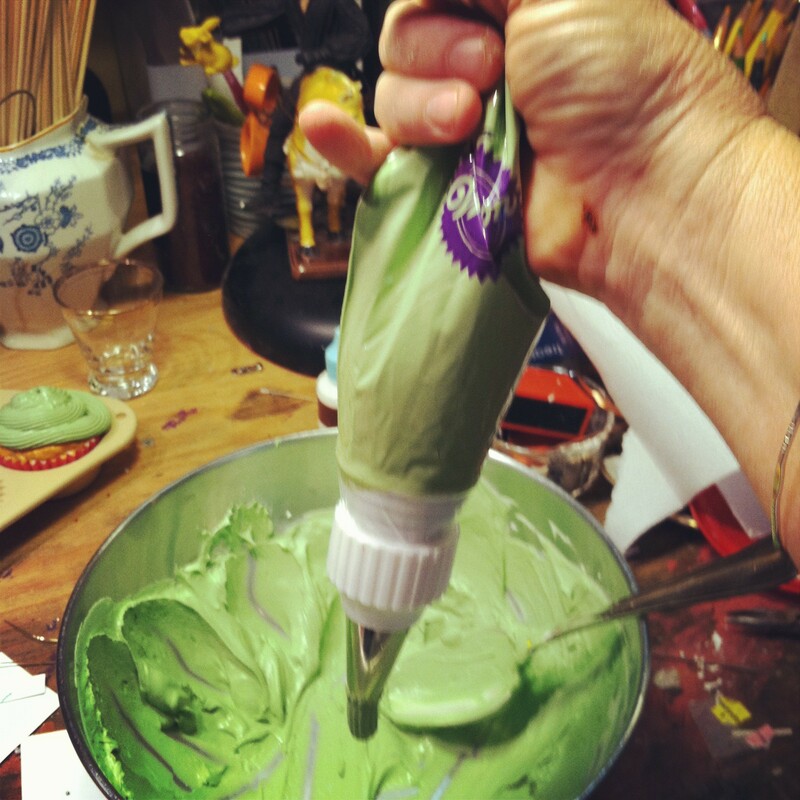 I used so much of it last year it looked I murdered Tinkerbell in my studio. I have since discovered that Martha Stewart makes some pretty nice glitter here in America and you can find it at Michael’s. Lots of colors including black, which I love. It comes in little round beads, irregular and round flakes, and in different sizes of all of the above. We have established I love glitter so its fun to find things that look better with glitter than without, like these funky little mirrors. Mirrors like these were very hot a few years ago, they are that acrylic plastic stuff all dolled up to look like stone. Most of them have gone to live in backrooms or on the shelves of Good Will. I kept seeing these ones piled on my work table until I had my Eureka! moment. You can use this same technique on a picture frame or wheatever strikes your fancy. I just happened to have these laying around and I am all about repurposing stuff. 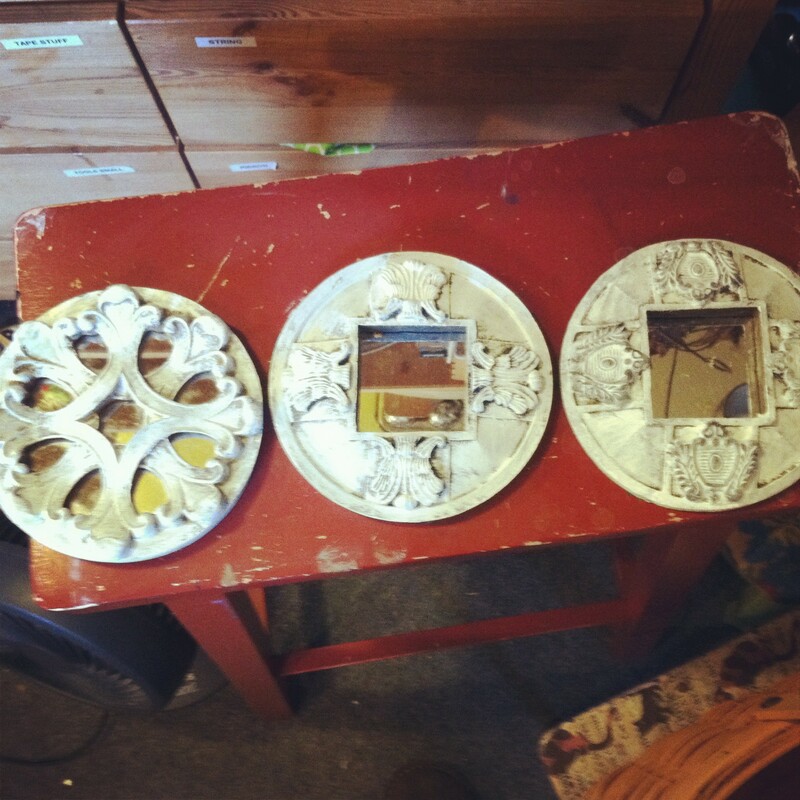 The first step is to take some acyrilic paint and a coarse brush and give the mirrors a rough coat of white. For me the goal was to keep their psuedo-aged appearance so I did not brush the paint on solidly. 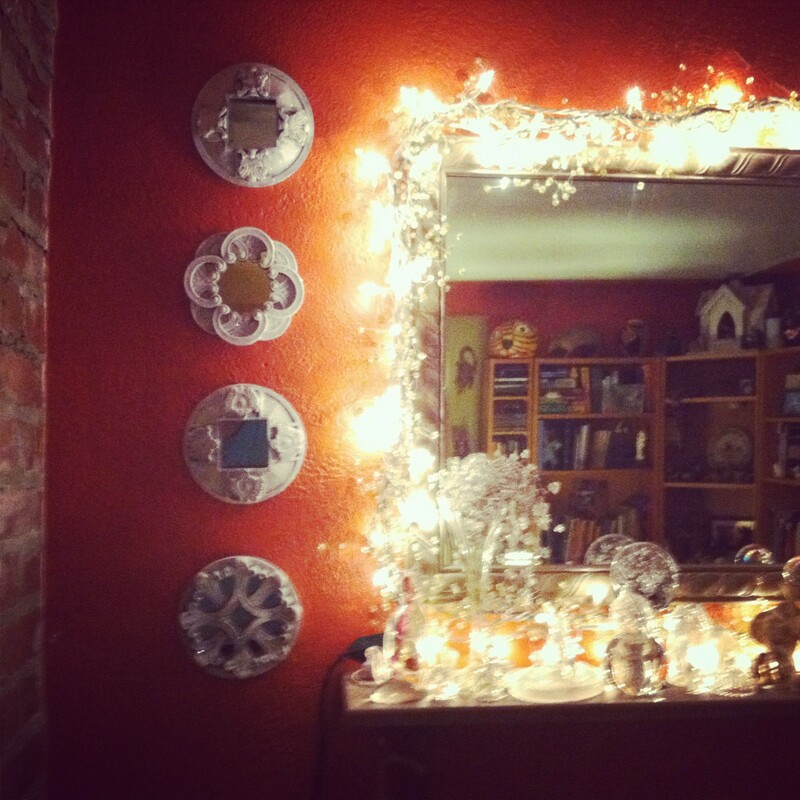 I painted all the mirrors and put them aside to dry for a few hours. Find an old paint brush, not a house painting brush, a painting a painting middle sized brush with fairly stiff bristles and get out a bottle of glue that will dry clear. 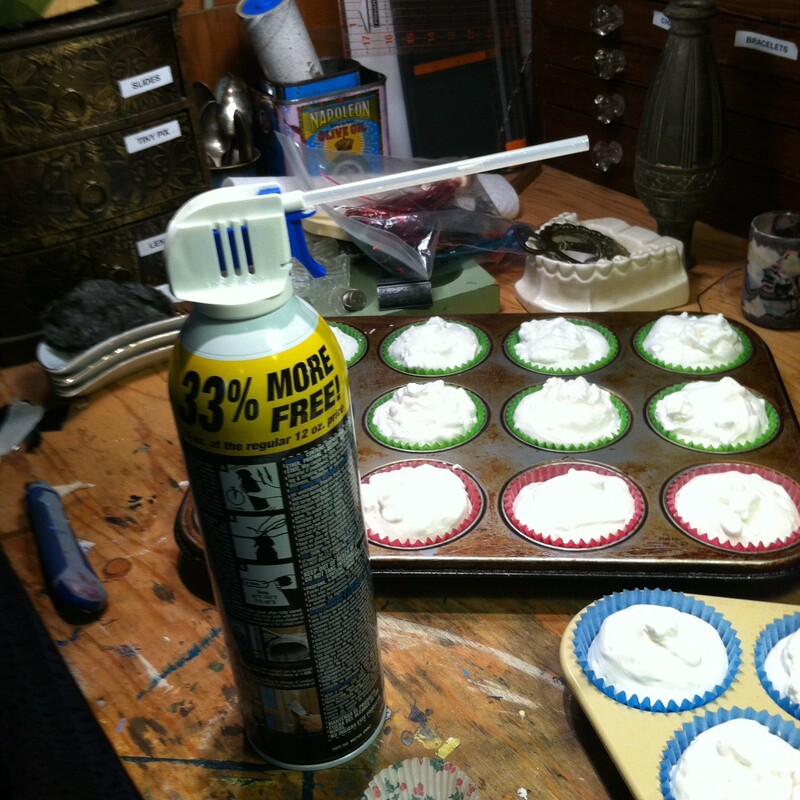 I used Alene’s clear glue which I keep around the studio. Note to self: wash the brush if you intend to use it again. 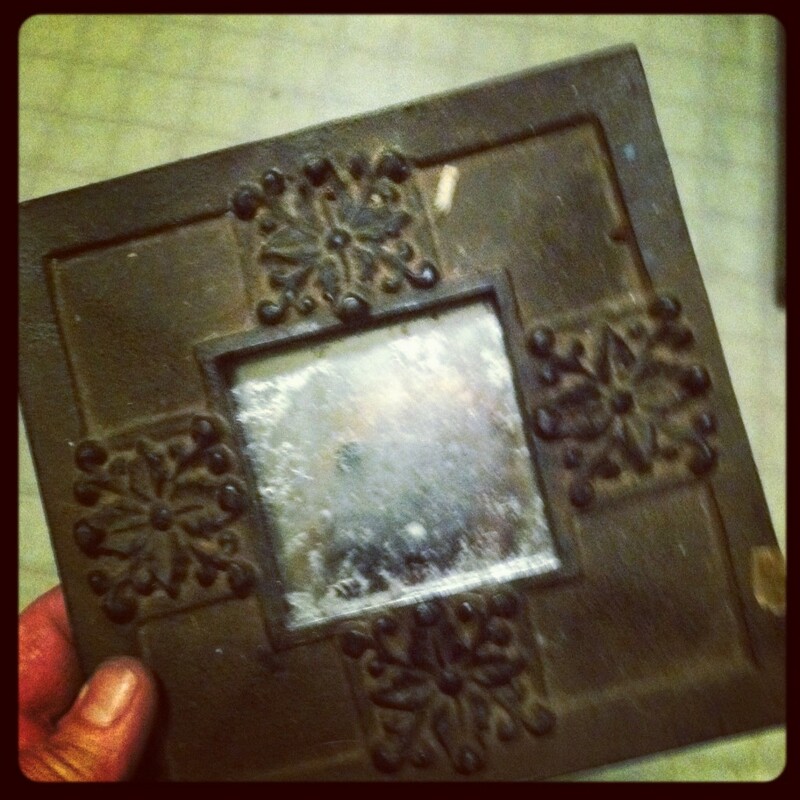 Lay the mirror on a glitter catching surfacing, an old tray works well. Paint a nice thick coat of glue all over the surface, remember the glue is drying so a) work fast b) get it on thickly c) don’t get it on so thick it drips. I did not glue the outside edges of the mirrors, no one will see them and it makes moving them a problem. I actually use a giant pie pan and these mirrors are round so it worked great and I could recapture all the glue that didn’t stick for re-use. 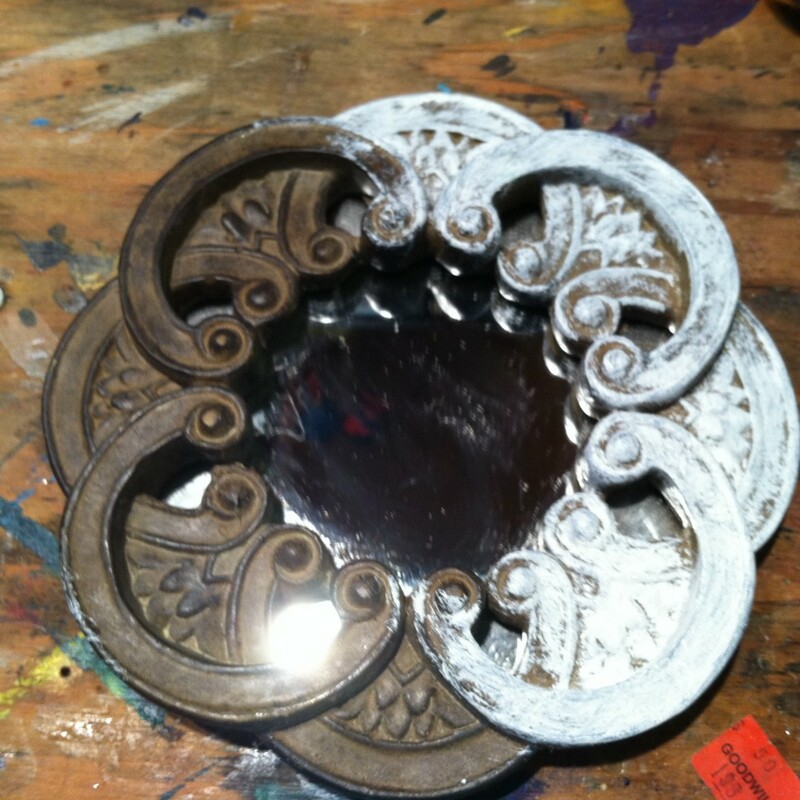 Pour glitter all over the mirror on your gluey surface. 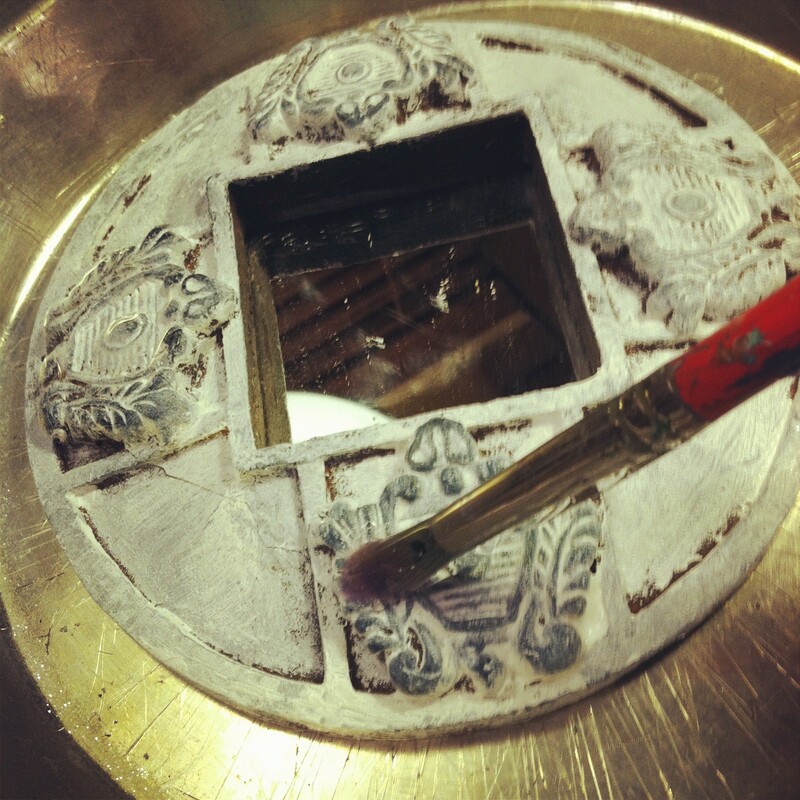 Carefully pick up the mirror and shake off the excess glitter onto your tray. 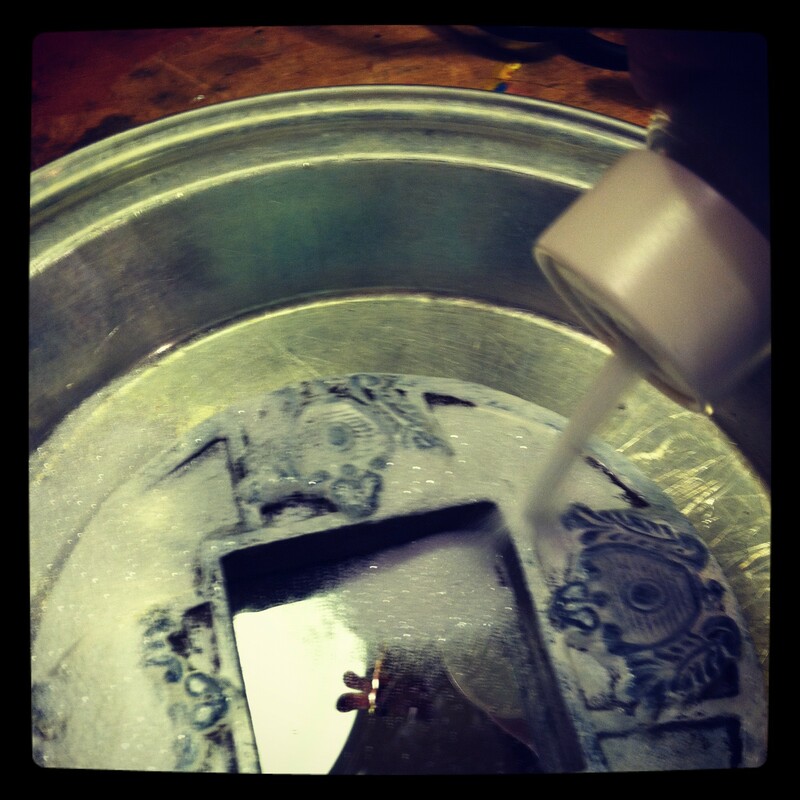 Some of the surfaces will still have excess glitter stuck on them, like the mirrored parts. After the glitter dries completely on its glue base, get your paint brush, the one you washed, and use it to dust off the parts you don’t want glittery, like the mirror bits. I took Qtips and sprayed them with windex to carefully clean the really intricate mirrored parts afterwards. 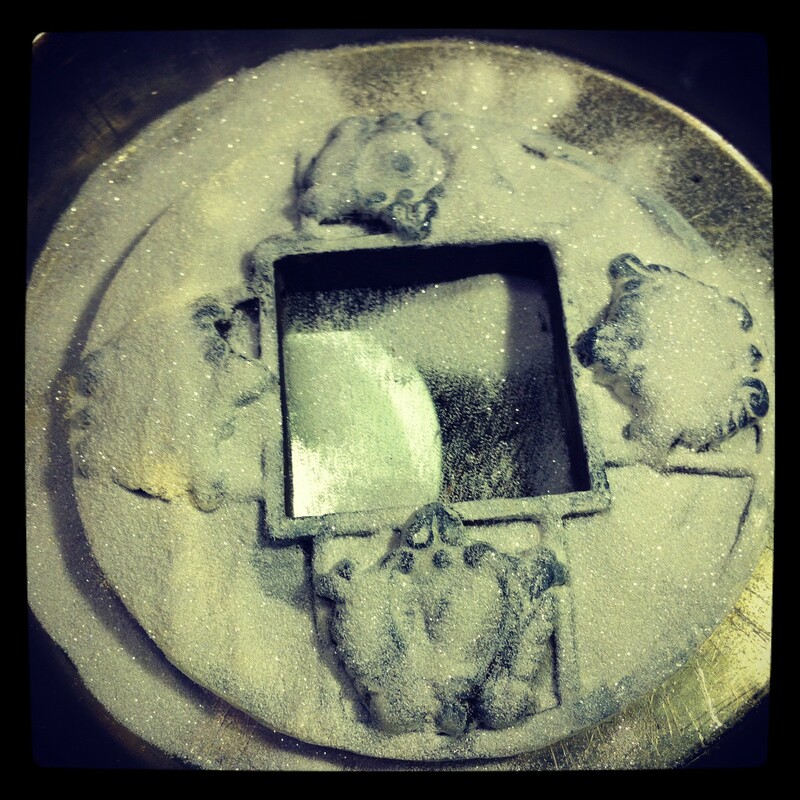 After shaking, before dusting the excess off and cleaning the tiny mirror bits. The payoff, Shiny Pretty Gorgeous Christmas accent! The glitter is subtle and hard to catch with a camera because it depends on reflected light which changes as you move. 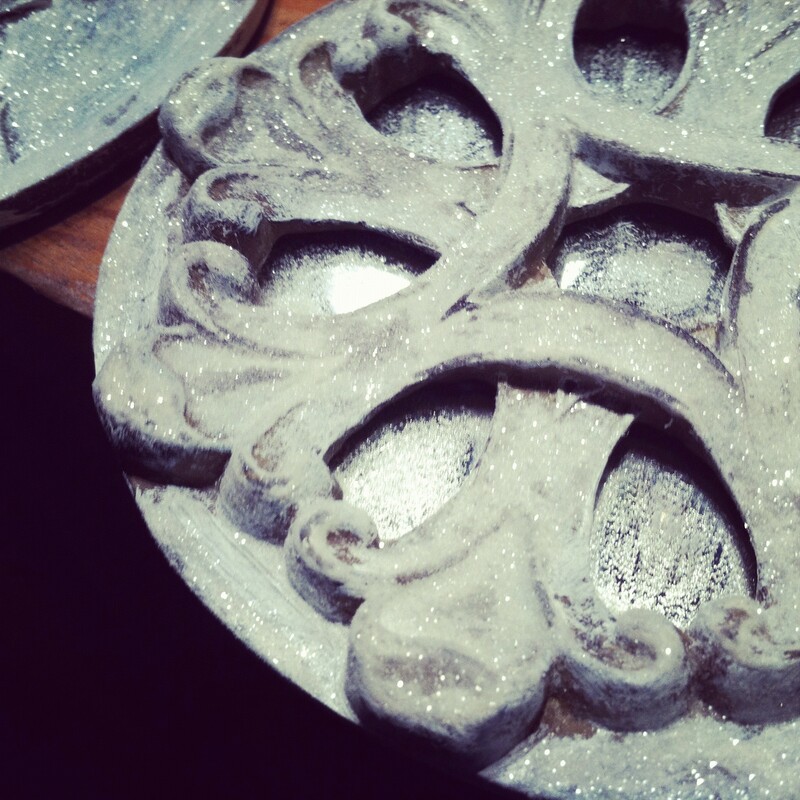 These really turned out nicely and they are a great addition to my lighted sparkle wall. 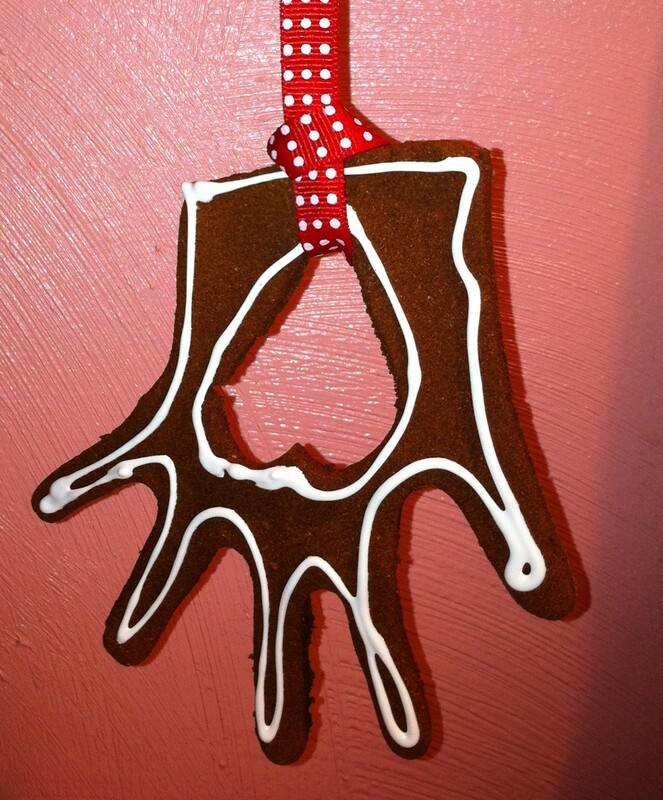 This entry was posted in Christmas Bunny, Directions for making cool stuff on November 11, 2011 by rox. I have gotten so many oohs and ahs over my ice white mantel piece I thought I’d share this easy idea that turned into something spectacular. I’m loving the way tiny white lights make magic with crystal and clear glass. There is something so festive and romantic about the combination–and since clear glass is not at the top of everyone’s must have list you can find some adorable pieces for not very much money. 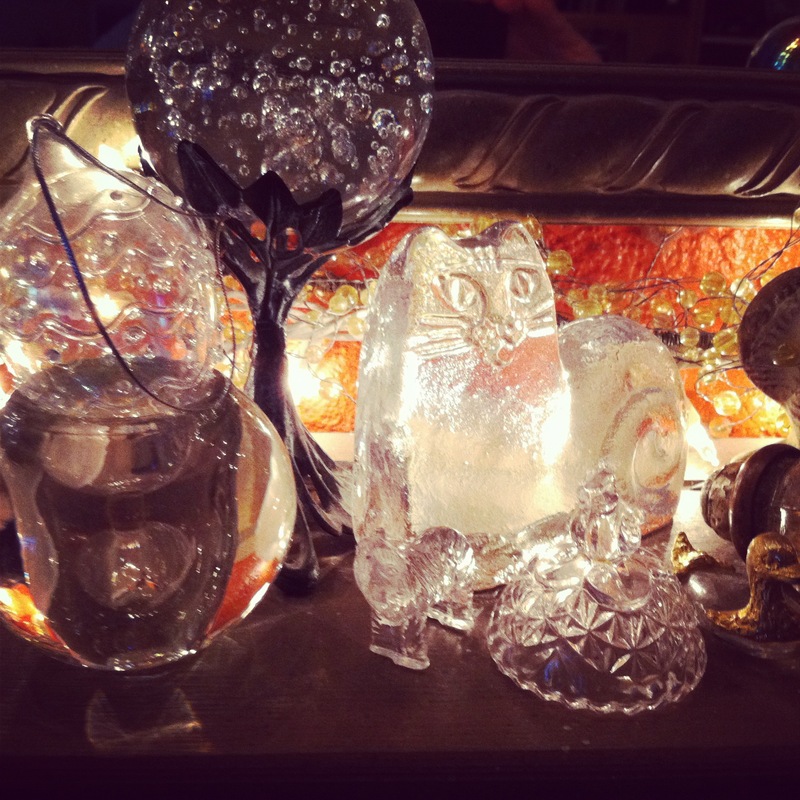 Add junk store finds to those cut glass and crystal pieces that mostly catch dust but are too nice to toss and presto! 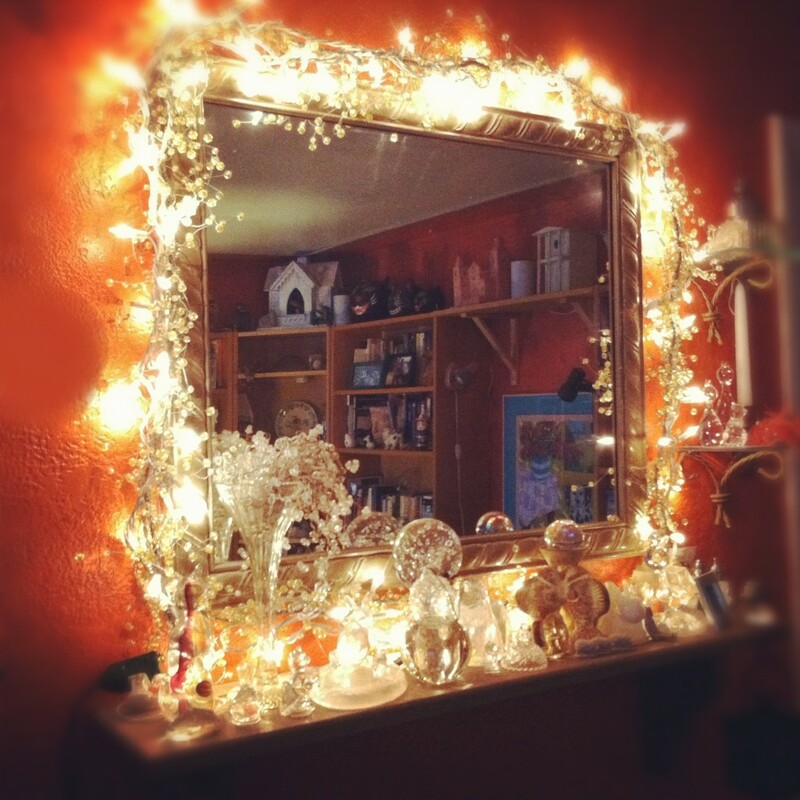 You have a stunning and icy sparkling holiday display. 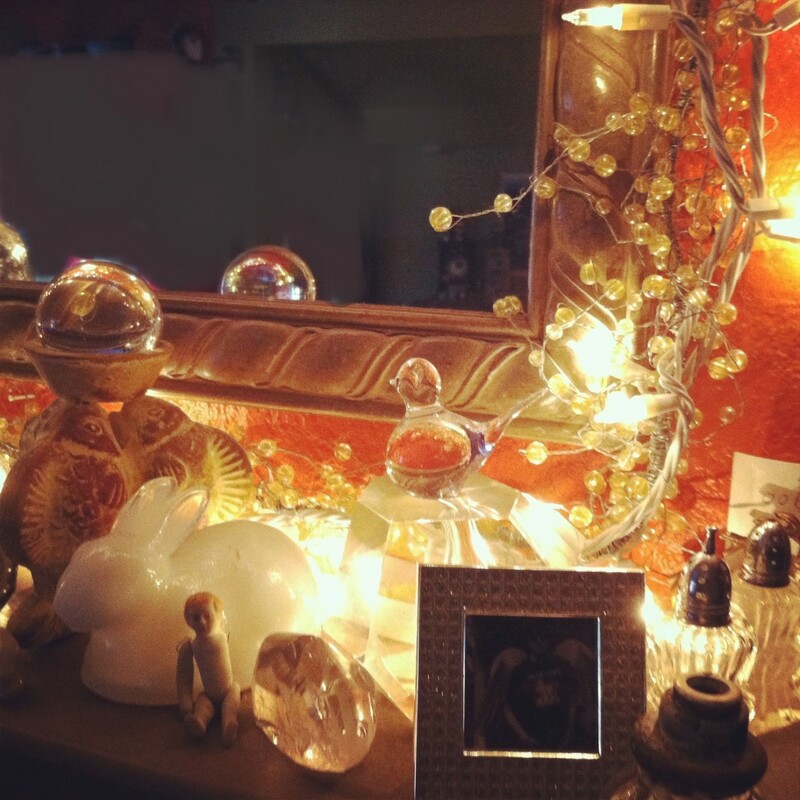 I put together old soda fountain glasses, paper weights, clear vases, candle holders, candy dishes, odd little clear glass pieces I picked up for their sparkle, and of course my peculiar favorite, glass door knobs, together they make a glittery wonderland on the mantelpiece. Take a long sparkly garland with crystals instead of flowers and wrap a long string of lights around it to hang around a mirror. I found my garland at Michael’s and saved a bunch with a coupon. Even old cut crystal salt shakers can add zing to your bling. 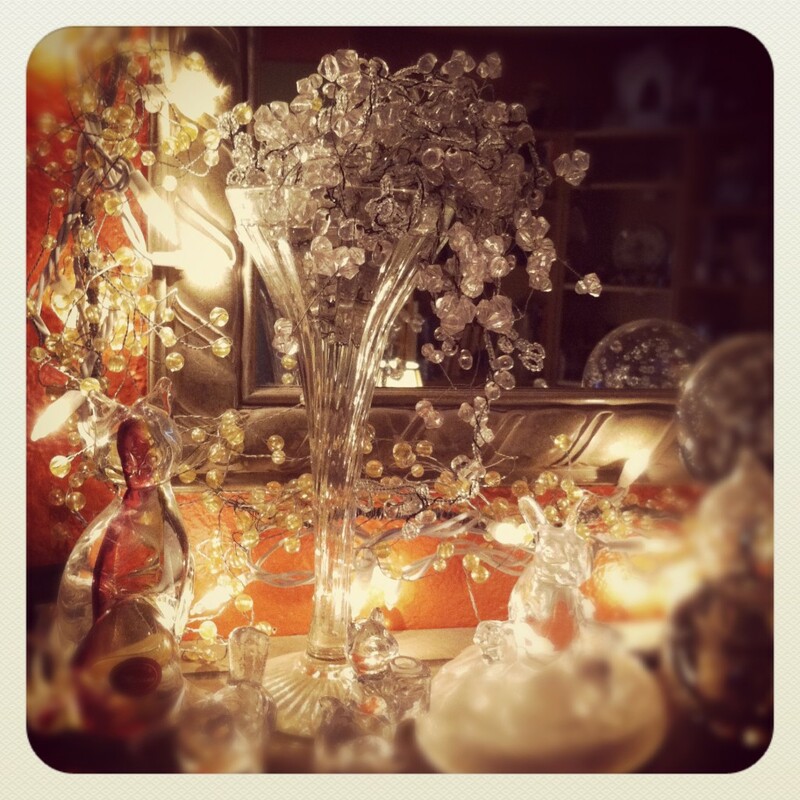 So pretty, mix it up with crytals, crystal and clear glass to sparkle up your room. I put as many pieces as I could fit on my shelf, all shapes and sizes too. I used solid glass like this Laurel Burch kitty, pressed glass like the little horse in front and cut glass like the candy dish top shown here. Good Will and Value Village often have cheap glass pieces for sale. The candy dish top is precious and for my purposes I didn’t care that the bottom was long gone, I just wanted it for its fun sparkle. I love this mantelpiece so much I may just keep it up year round! This entry was posted in Christmas Bunny, Directions for making cool stuff and tagged Christmas decors with clear glass, clear glass decor, mantelpiece decor, mantelpiece ideas on November 9, 2011 by rox.